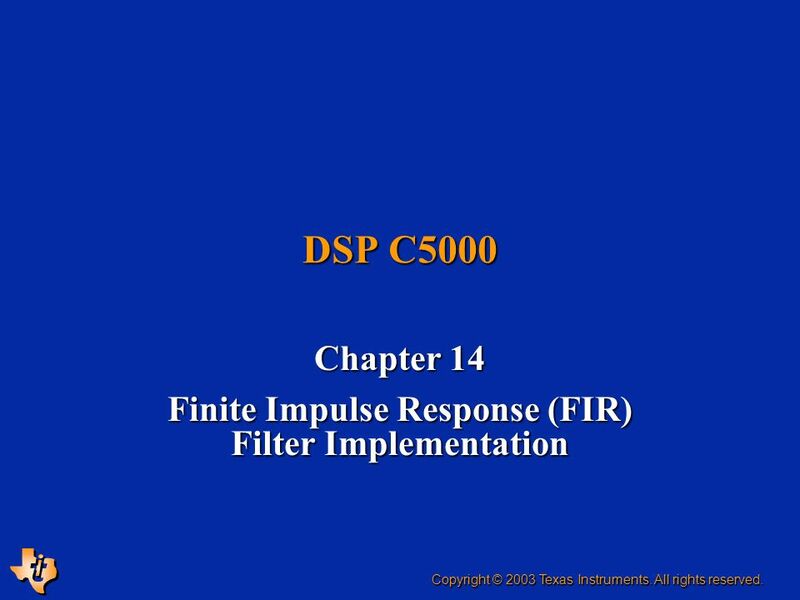 DSP C5000 Chapter 14 Finite Impulse Response (FIR) Filter Implementation Copyright © 2003 Texas Instruments. All rights reserved. 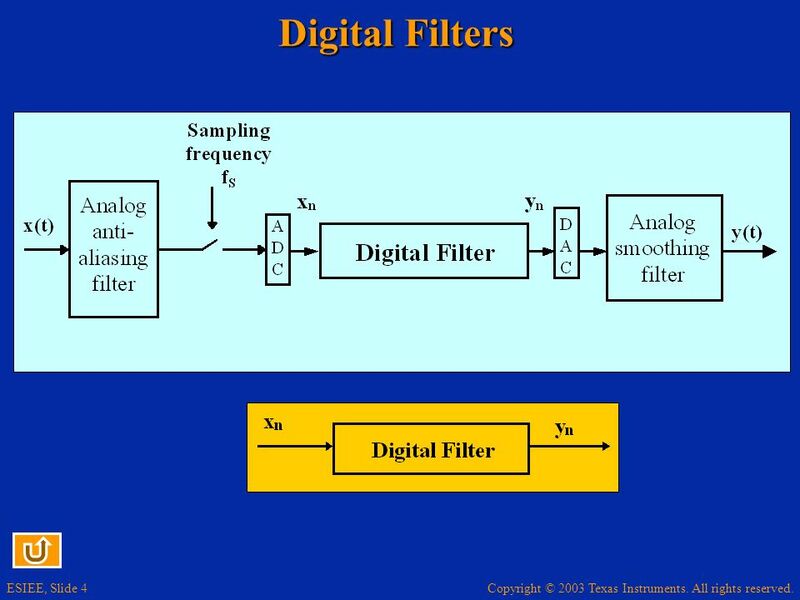 4 Digital Filters The choice of the sampling frequency depends on value the maximal frequency fmax in the signal. 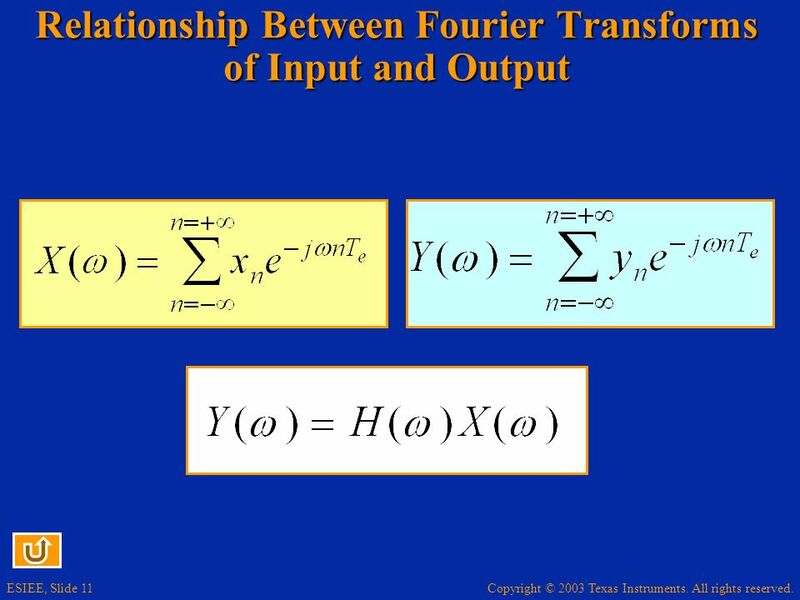 The Shannon theorem sugests to use fS > 2 fmax. 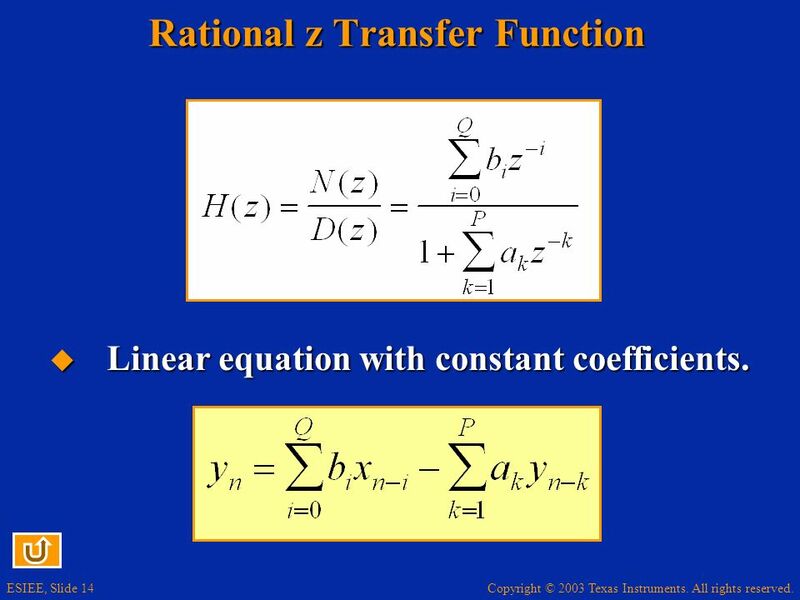 Linear equation with constant coefficients. 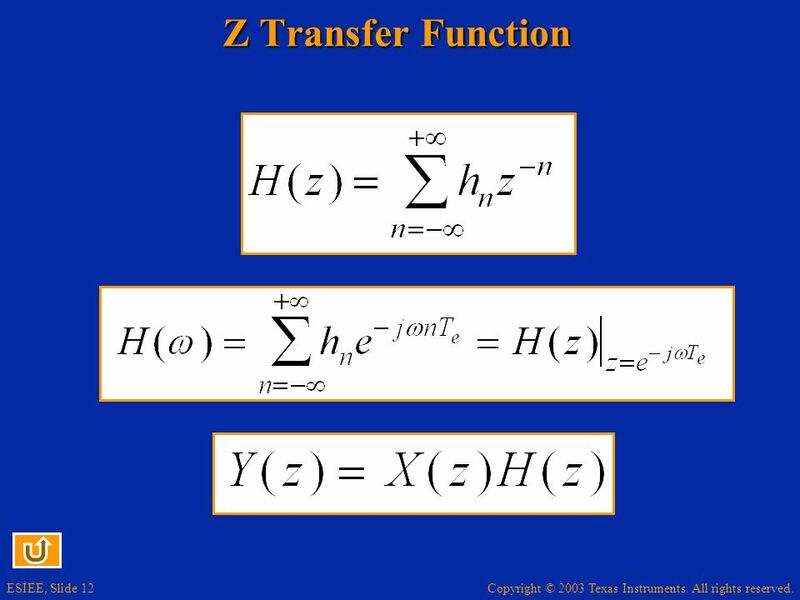 Rational z transfer function are easy to build. 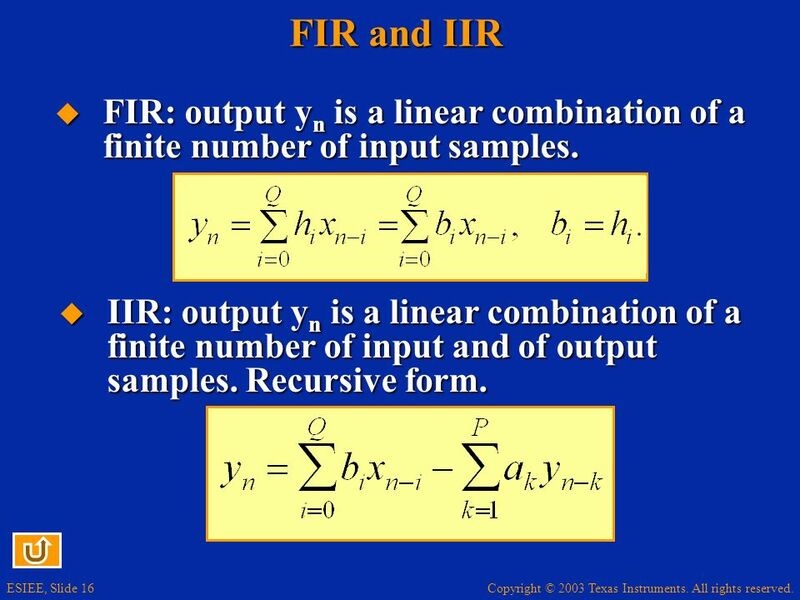 16 FIR and IIR FIR: output yn is a linear combination of a finite number of input samples. 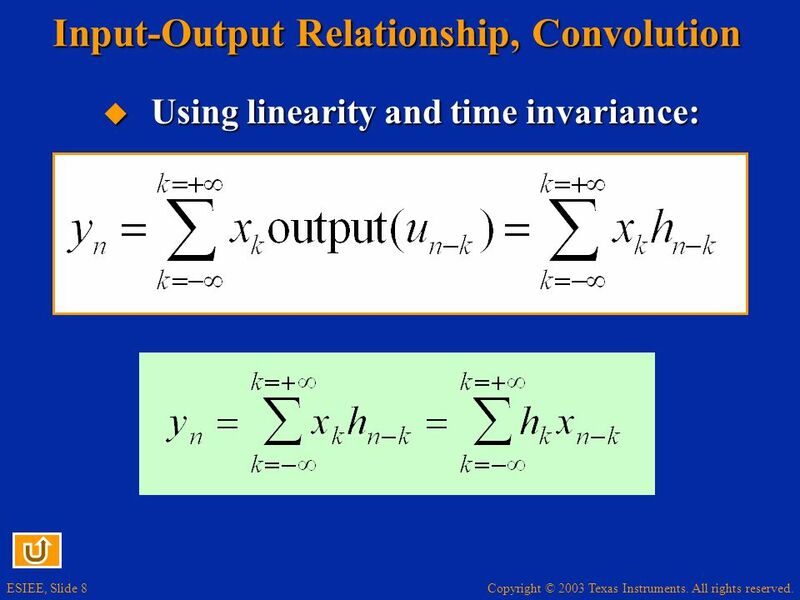 IIR: output yn is a linear combination of a finite number of input and of output samples. Recursive form. 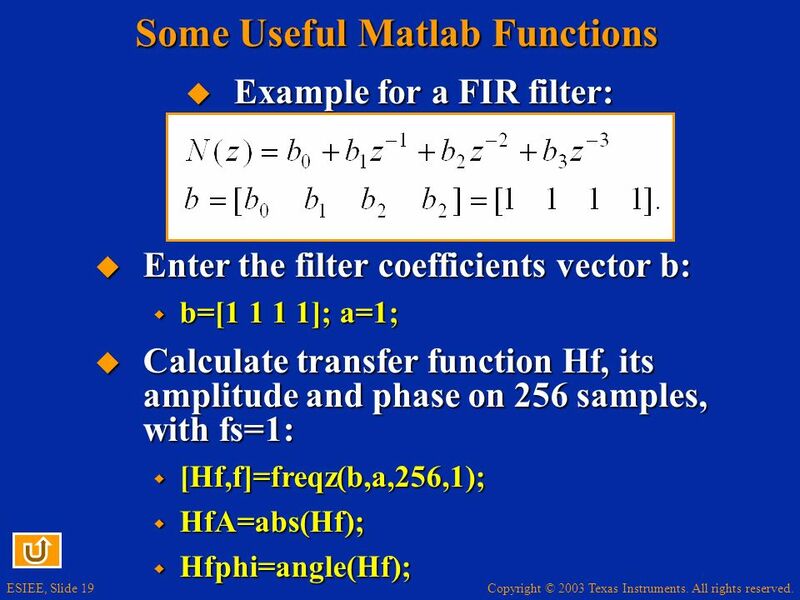 Example for a FIR filter: Enter the filter coefficients vector b: b=[ ]; a=1; Calculate transfer function Hf, its amplitude and phase on 256 samples, with fs=1: [Hf,f]=freqz(b,a,256,1); HfA=abs(Hf); Hfphi=angle(Hf); The sampling frequency is set to 1. 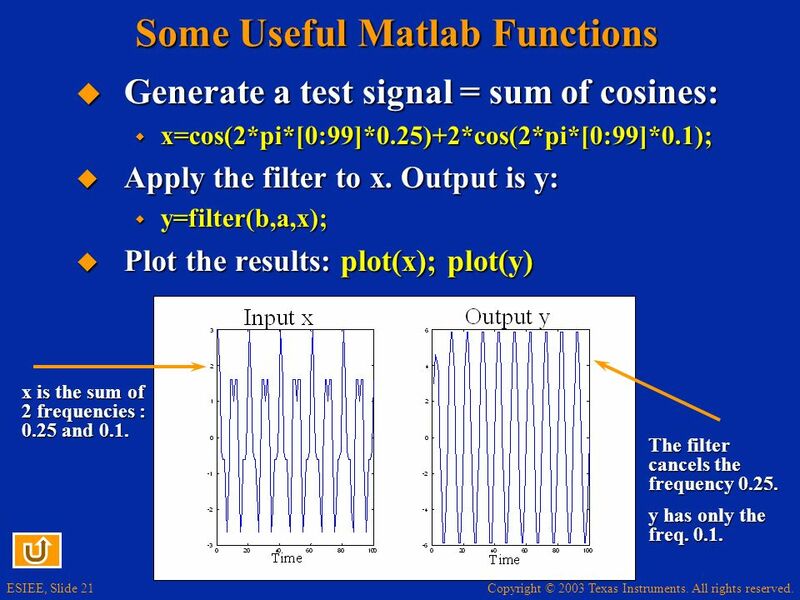 Generate a test signal = sum of cosines: x=cos(2*pi*[0:99]*0.25)+2*cos(2*pi*[0:99]*0.1); Apply the filter to x. 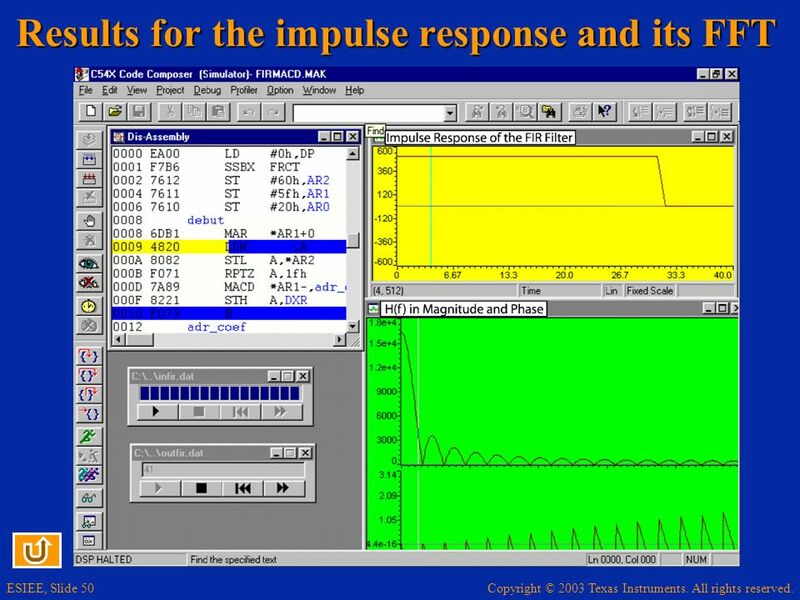 Output is y: y=filter(b,a,x); Plot the results: plot(x); plot(y) x is the sum of 2 frequencies : 0.25 and 0.1. 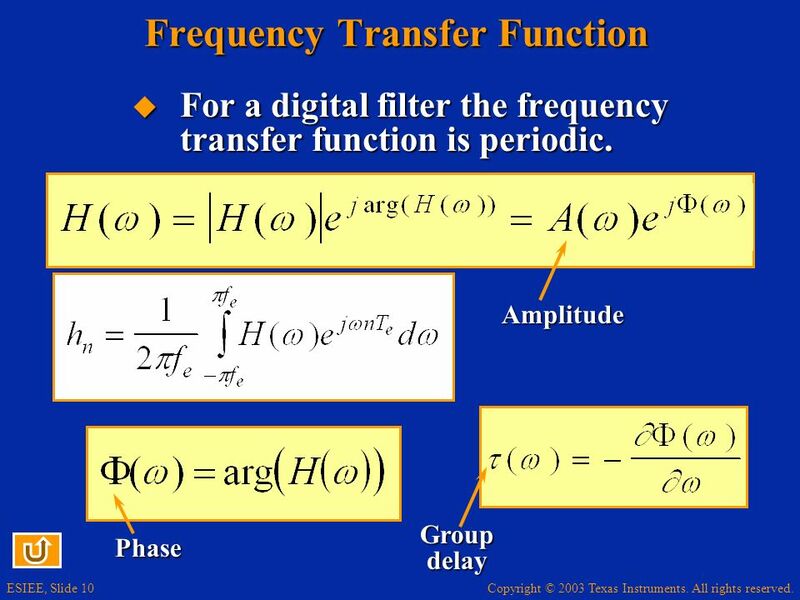 The frequency 0.25 is cancelled by the filter. 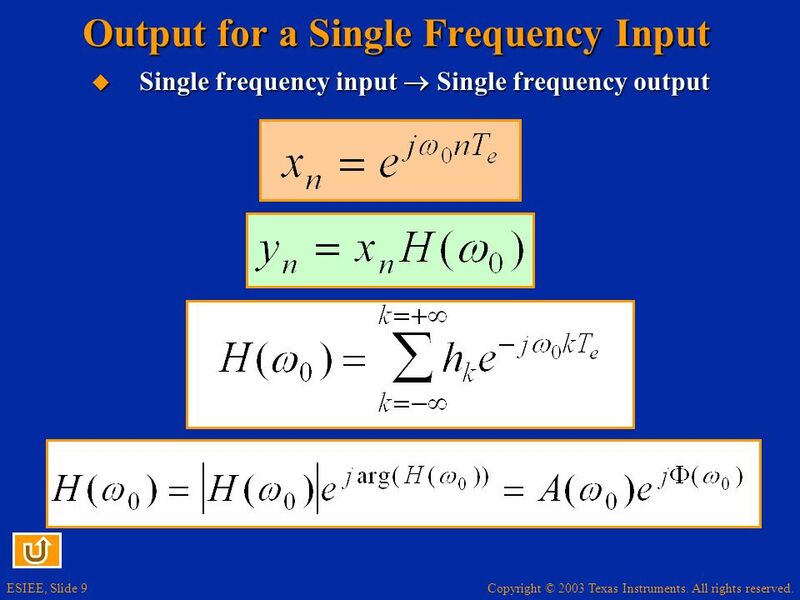 There is only the frquency 0.1 in the output. Notice the transient response. 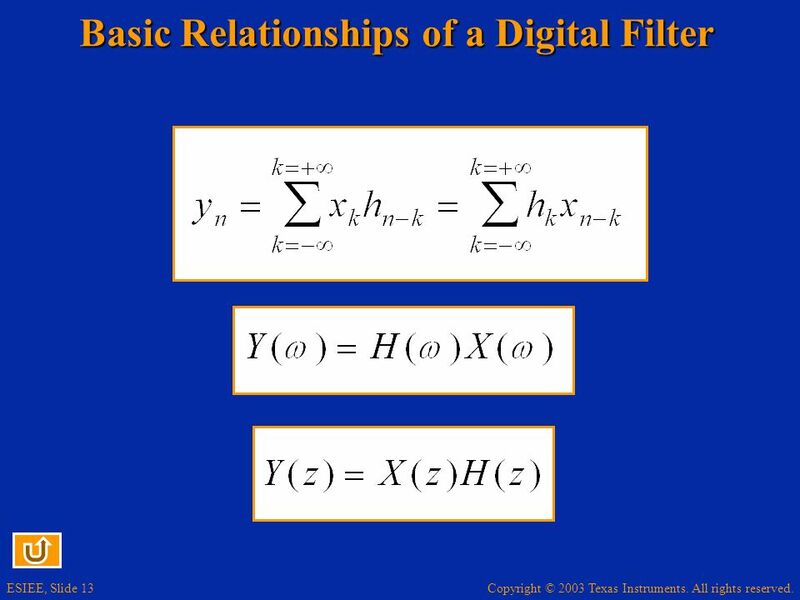 The filter cancels the frequency 0.25. y has only the freq. 0.1. 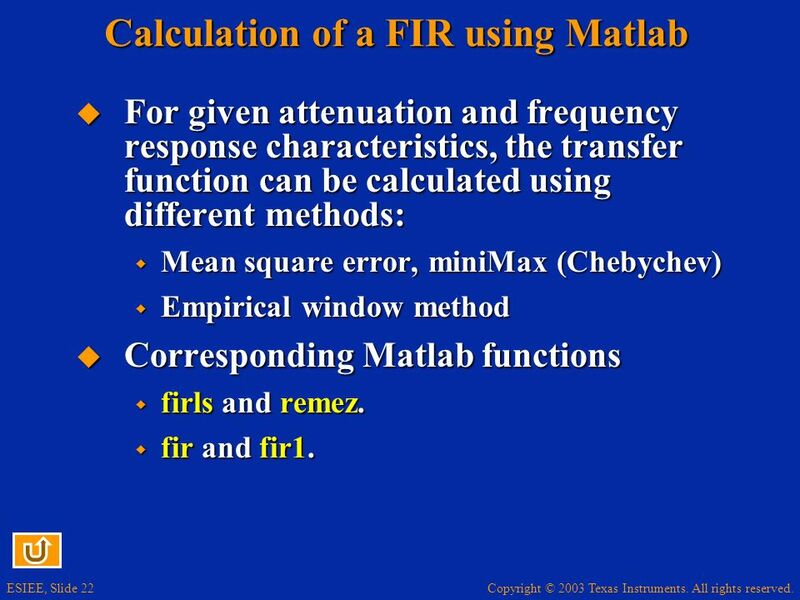 For given attenuation and frequency response characteristics, the transfer function can be calculated using different methods: Mean square error, miniMax (Chebychev) Empirical window method Corresponding Matlab functions firls and remez. 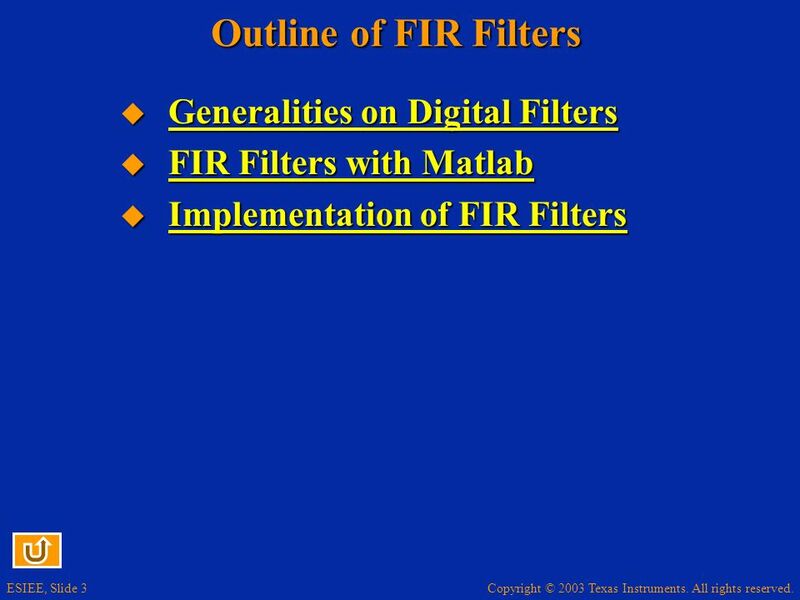 fir and fir1. 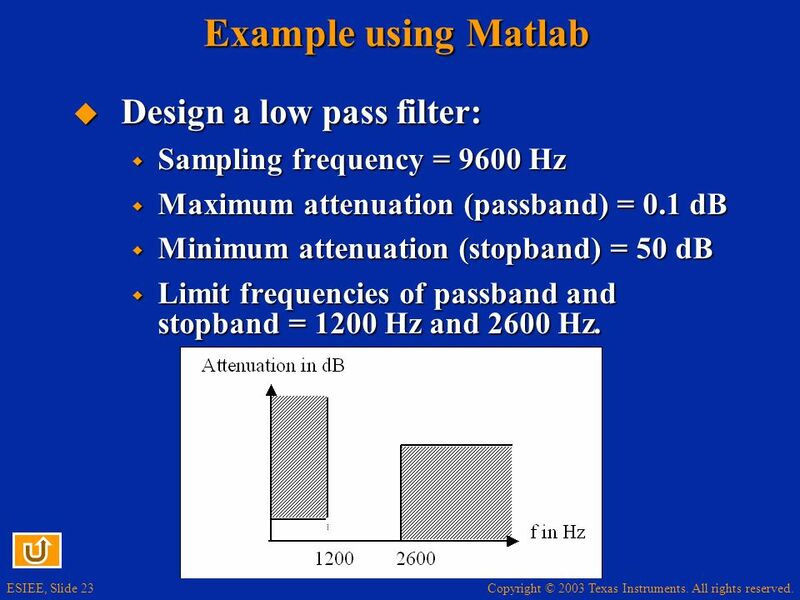 Sampling frequency = 9600 Hz Maximum attenuation (passband) = 0.1 dB Minimum attenuation (stopband) = 50 dB Limit frequencies of passband and stopband = 1200 Hz and 2600 Hz. 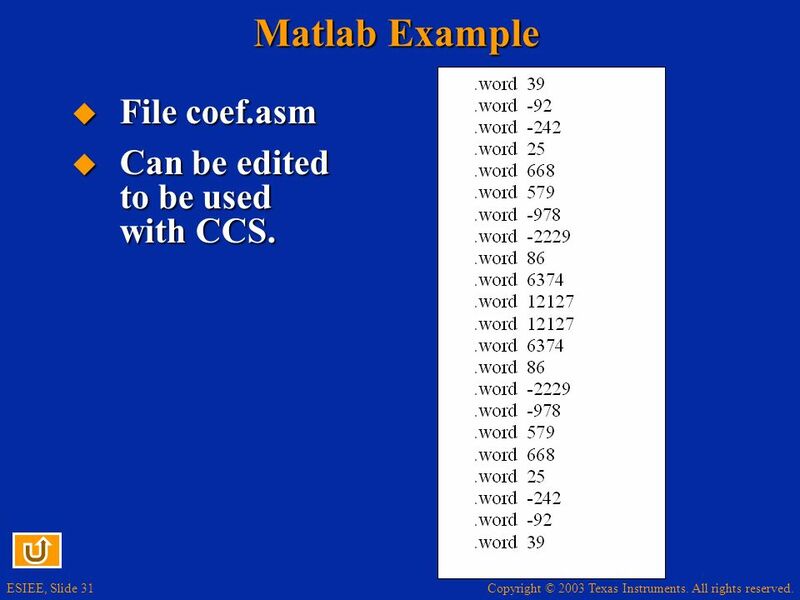 31 Matlab Example File coef.asm Can be edited to be used with CCS. 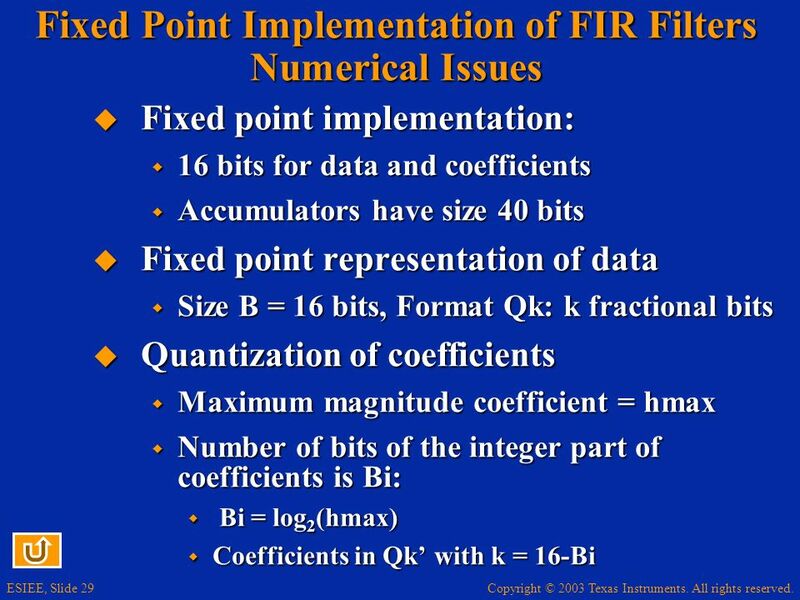 Common case: Data and coefficients in Q15 format Product h(i)x(n-i) in Q30 (2 sign bits) By shifting products 1 bit left, the product are in Q31 format with only 1 sign bit. 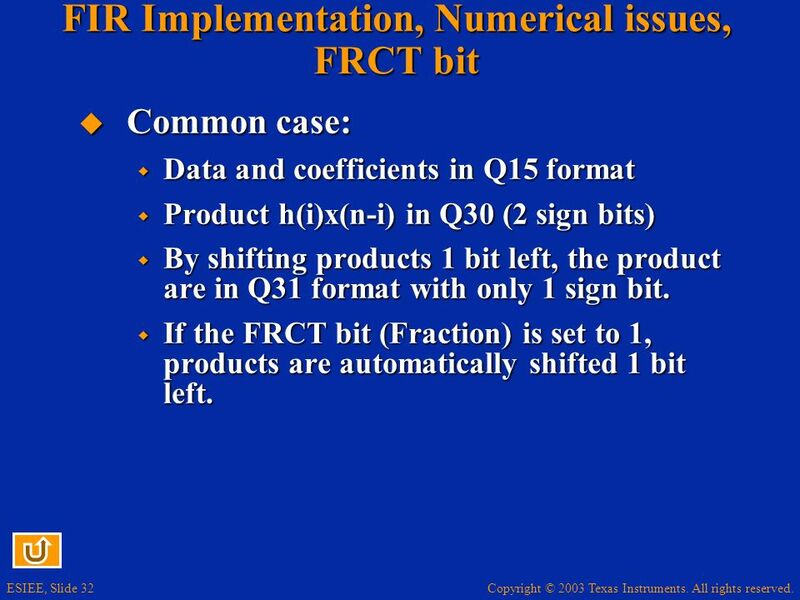 If the FRCT bit (Fraction) is set to 1, products are automatically shifted 1 bit left. 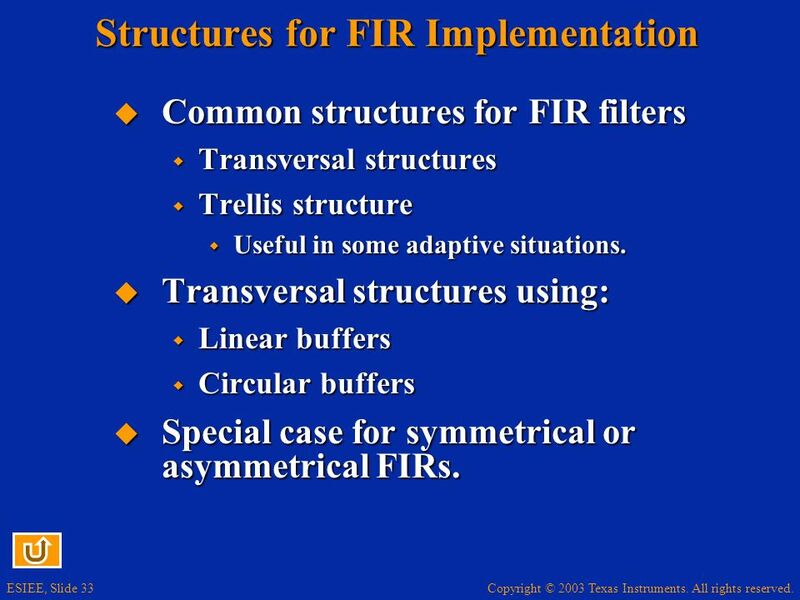 Common structures for FIR filters Transversal structures Trellis structure Useful in some adaptive situations. 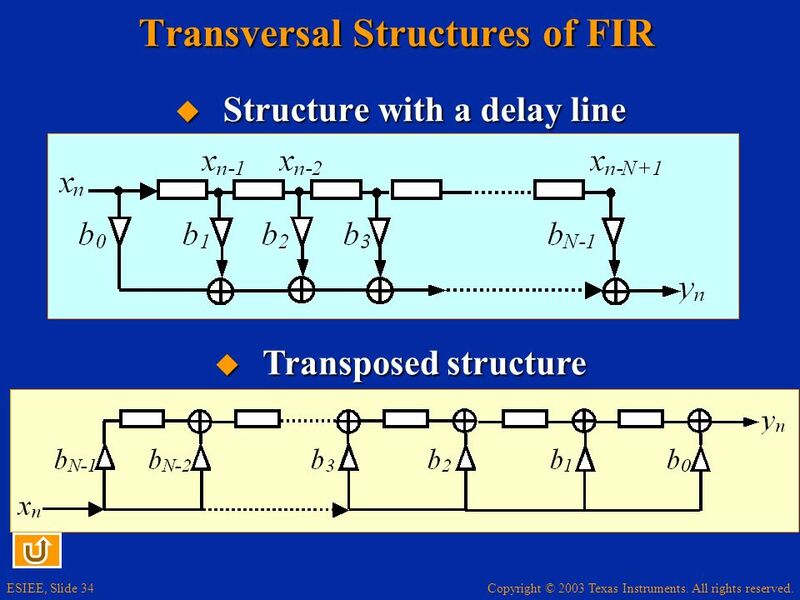 Transversal structures using: Linear buffers Circular buffers Special case for symmetrical or asymmetrical FIRs. 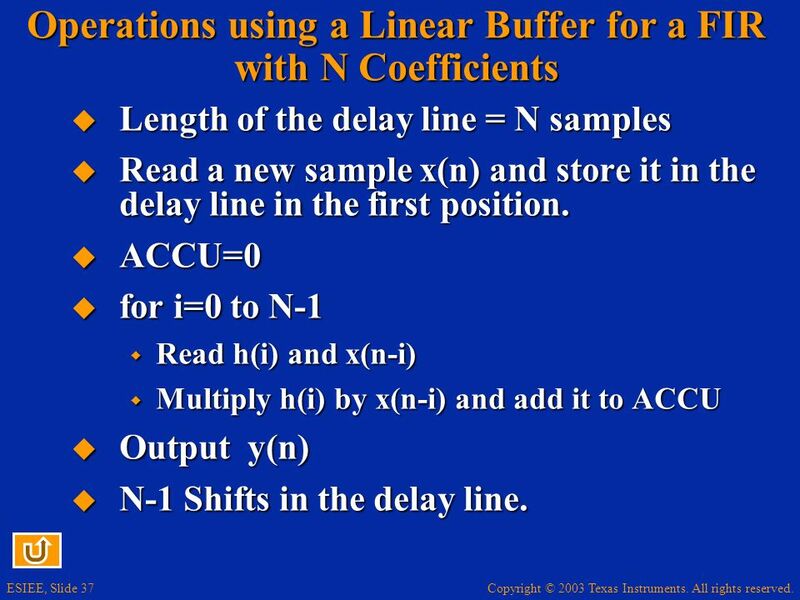 Length of the delay line = N samples Read a new sample x(n) and store it in the delay line in the first position. 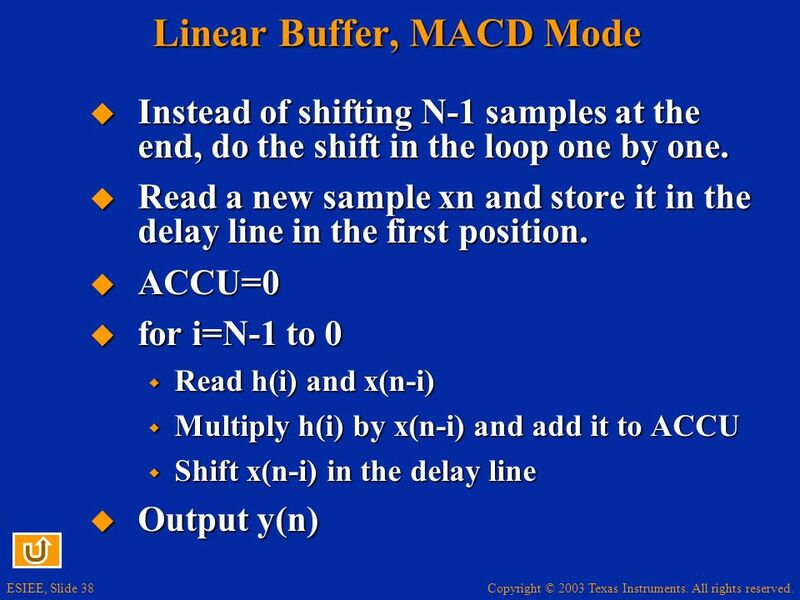 ACCU=0 for i=0 to N-1 Read h(i) and x(n-i) Multiply h(i) by x(n-i) and add it to ACCU Output y(n) N-1 Shifts in the delay line. 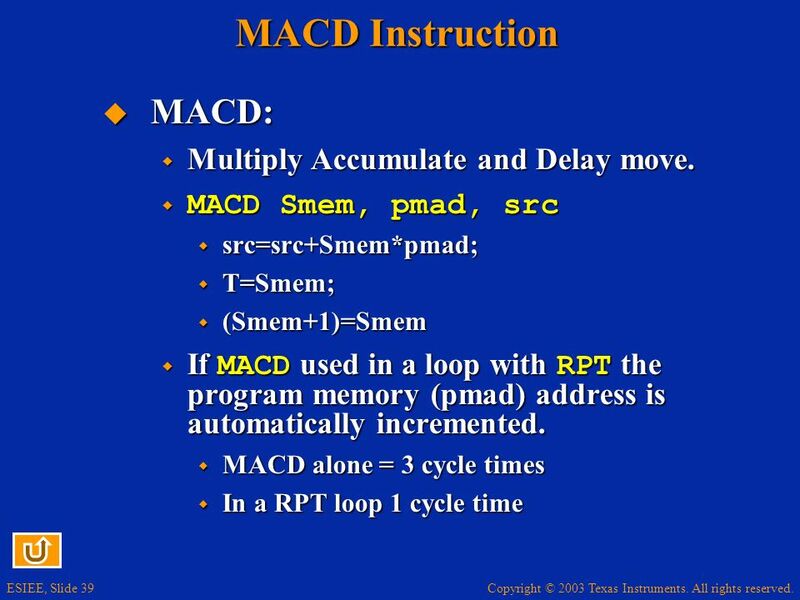 39 MACD Instruction MACD: Multiply Accumulate and Delay move. 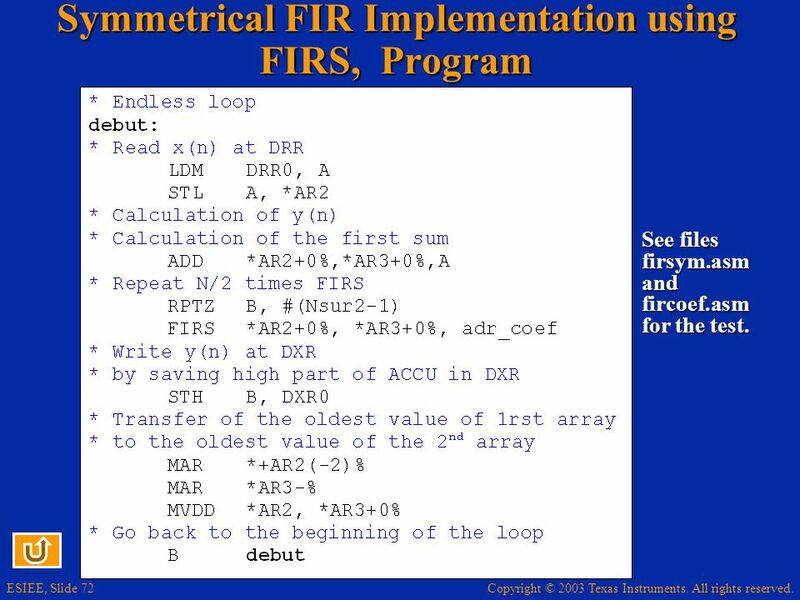 Repeat next instruction n+1 times. 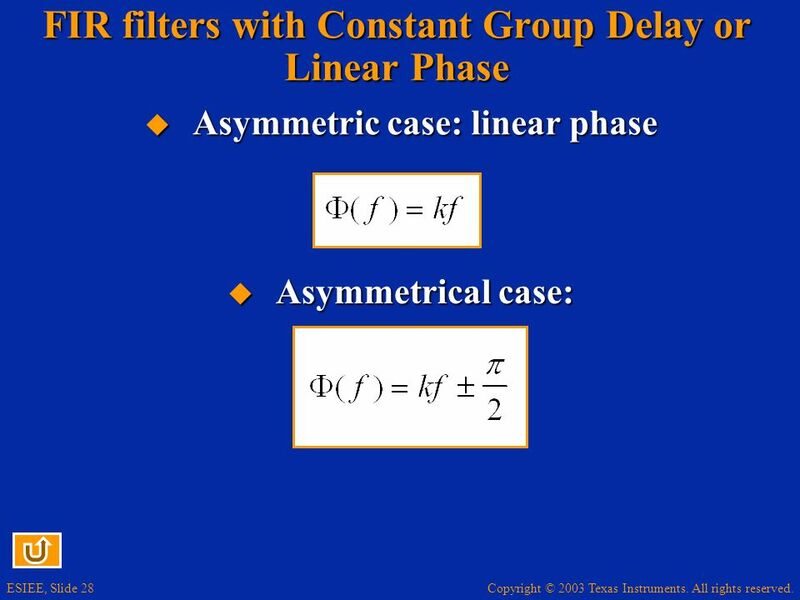 Repetition counter set to n and decreases until 0. 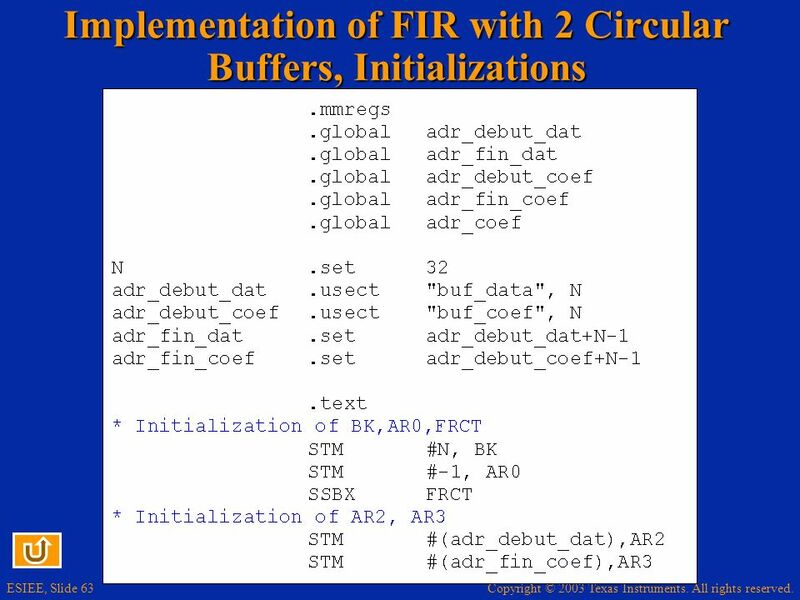 1 or 2 cycles, not interruptible. 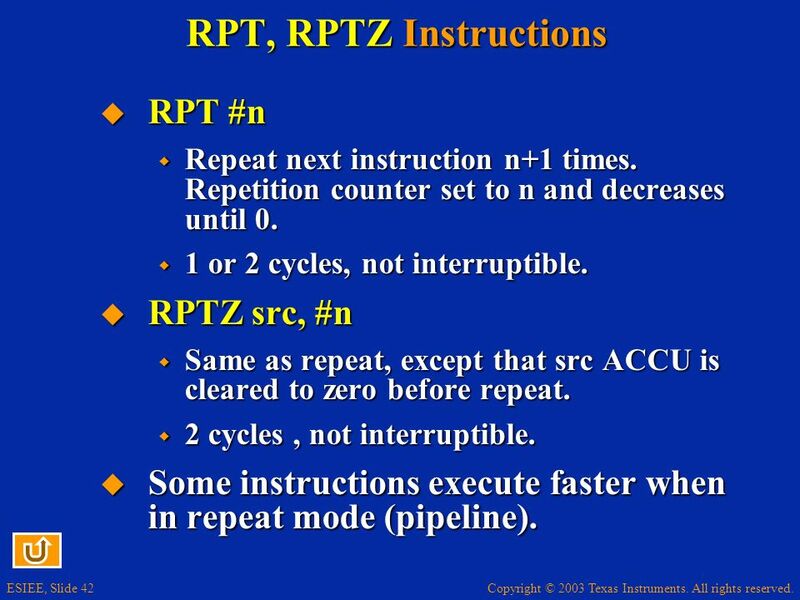 RPTZ src, #n Same as repeat, except that src ACCU is cleared to zero before repeat. 2 cycles , not interruptible. Some instructions execute faster when in repeat mode (pipeline). 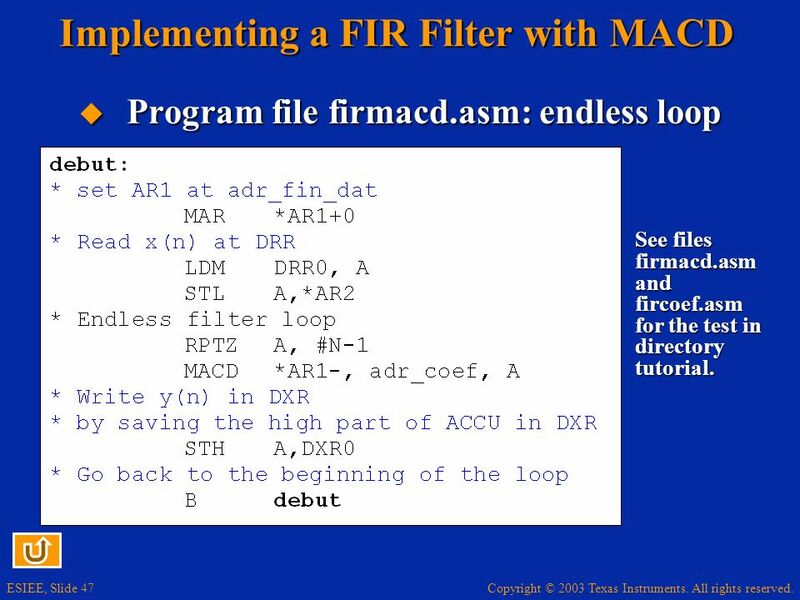 Program file firmacd.asm: endless loop See files firmacd.asm and fircoef.asm for the test in directory tutorial. 51 Second Test New test with a sine input. 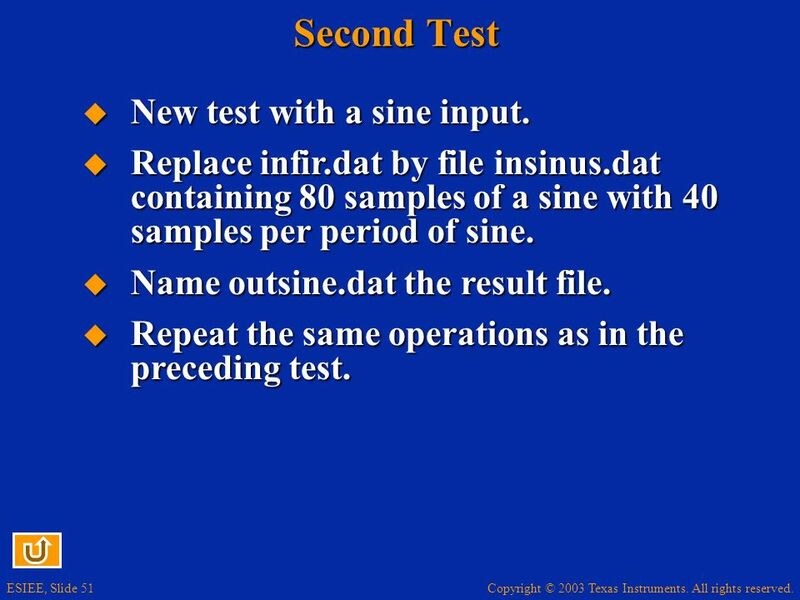 Replace infir.dat by file insinus.dat containing 80 samples of a sine with 40 samples per period of sine. Name outsine.dat the result file. Repeat the same operations as in the preceding test. 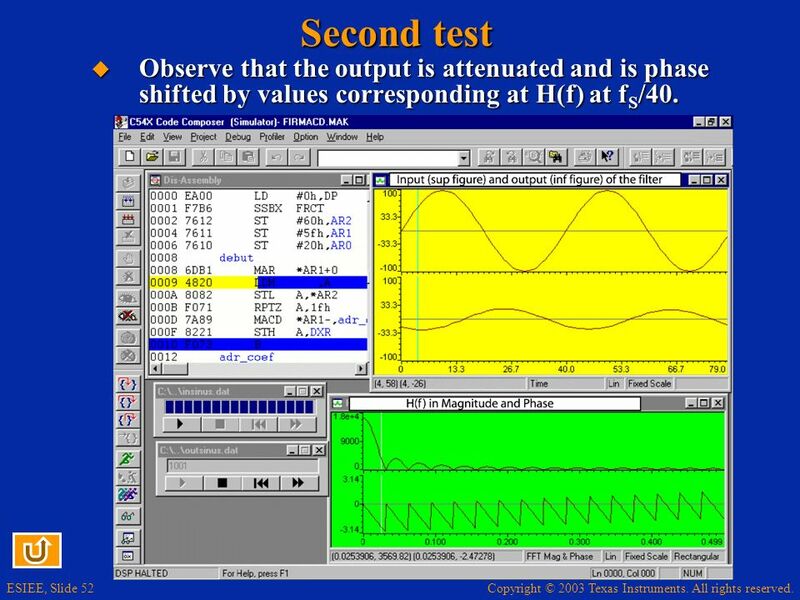 52 Second test Observe that the output is attenuated and is phase shifted by values corresponding at H(f) at fS/40. 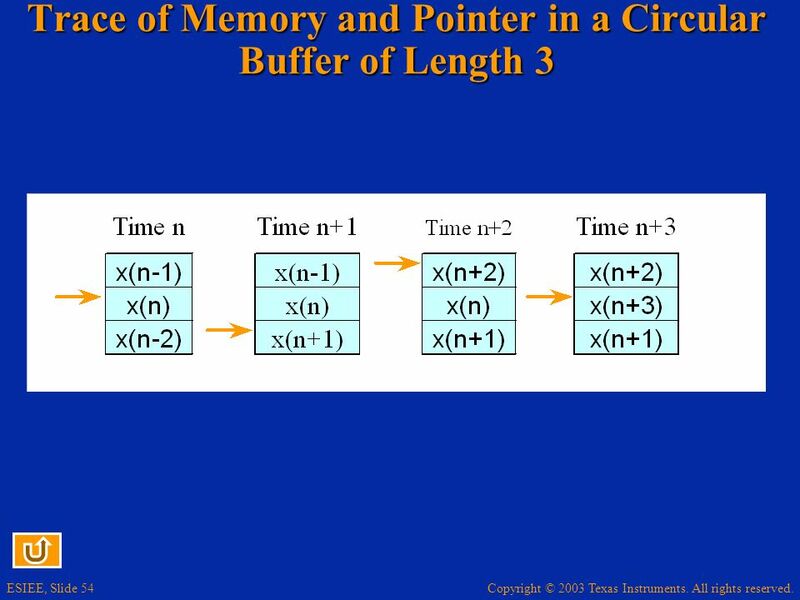 A circular buffer of length N is a block of contiguous memory words addressed by a pointer using a modulo N addressing mode. The 2 extreme words of the memory block are considered as contiguous. 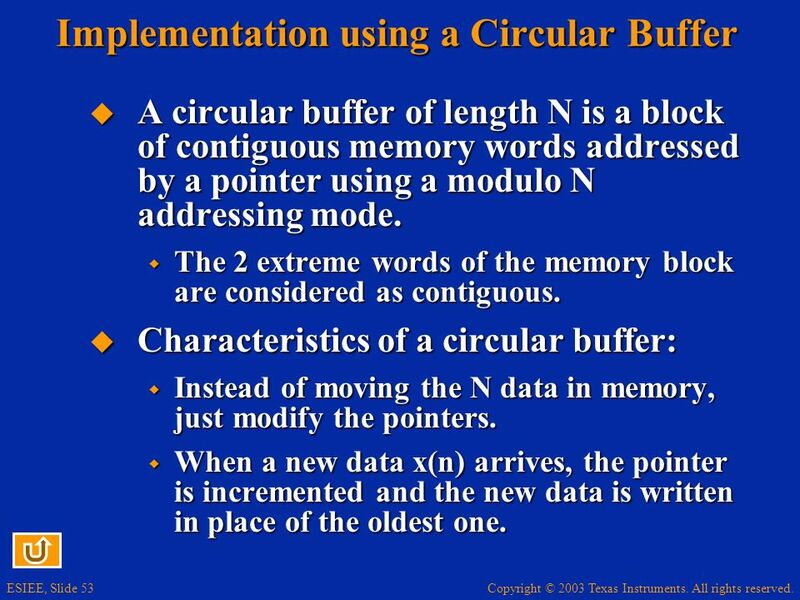 Characteristics of a circular buffer: Instead of moving the N data in memory, just modify the pointers. 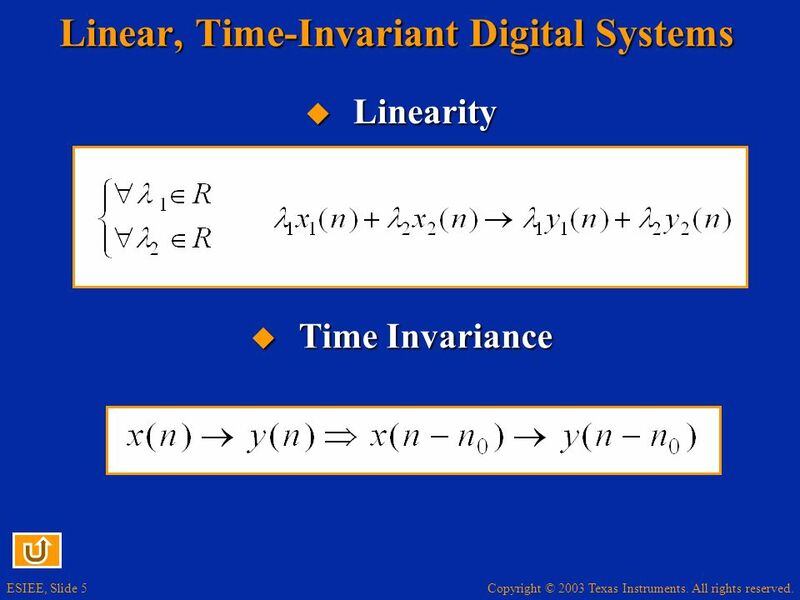 When a new data x(n) arrives, the pointer is incremented and the new data is written in place of the oldest one. 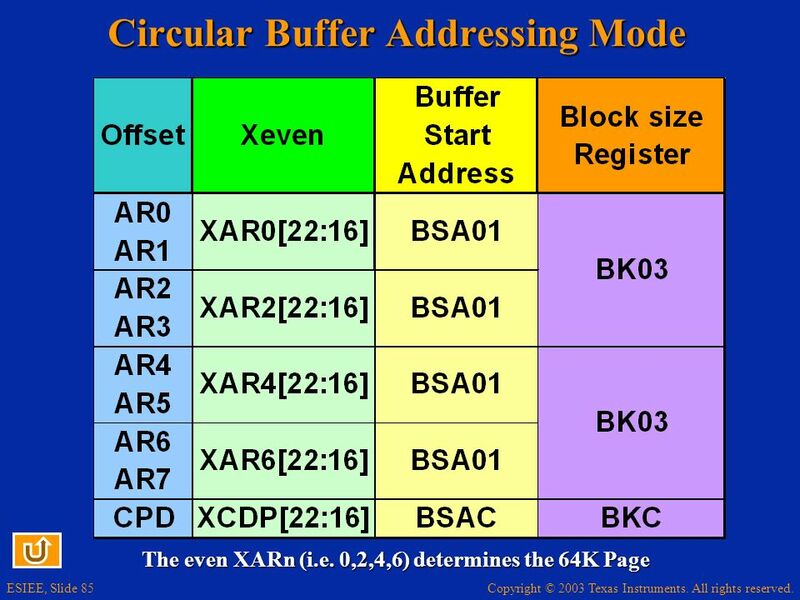 Circular indirect addressing mode: *ARi-%, *ARi+%, *ARi-0%, *ARi+0%, *ARi(lk)% In dual operand mode Xmem, Ymem: *ARi+0% only valid mode To perform a decrement, store a negative value in AR0. 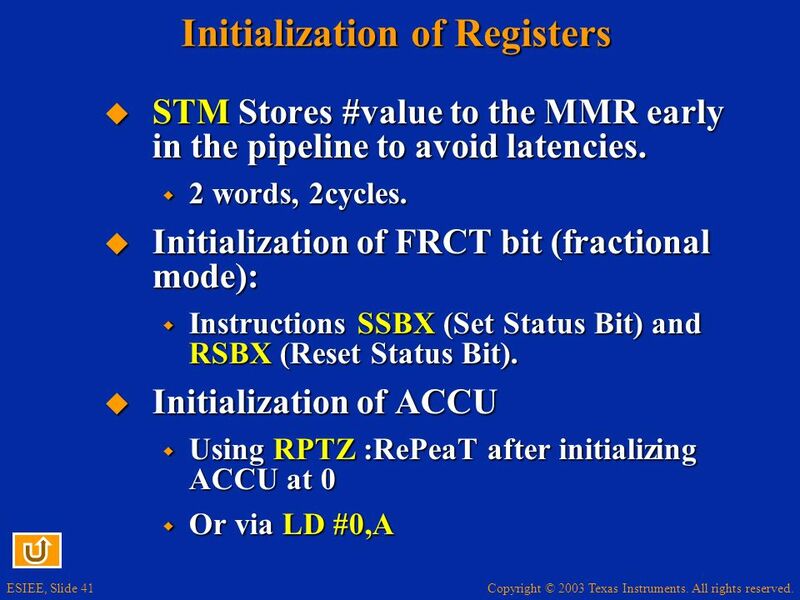 BK register: Stores the size N of the circular buffer. Must be initialized before use. 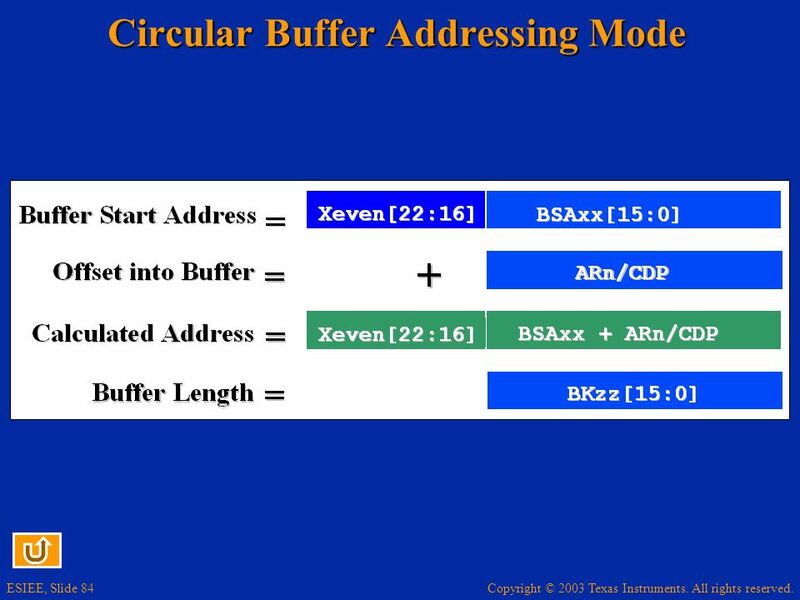 There may be several circular buffers at different addresses at the same time but with the same length. 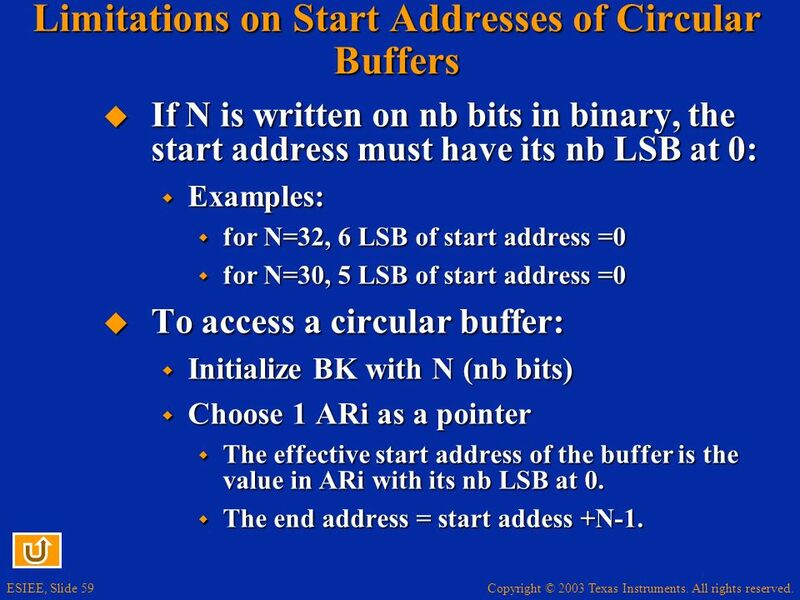 If N is written on nb bits in binary, the start address must have its nb LSB at 0: Examples: for N=32, 6 LSB of start address =0 for N=30, 5 LSB of start address =0 To access a circular buffer: Initialize BK with N (nb bits) Choose 1 ARi as a pointer The effective start address of the buffer is the value in ARi with its nb LSB at 0. The end address = start addess +N-1. 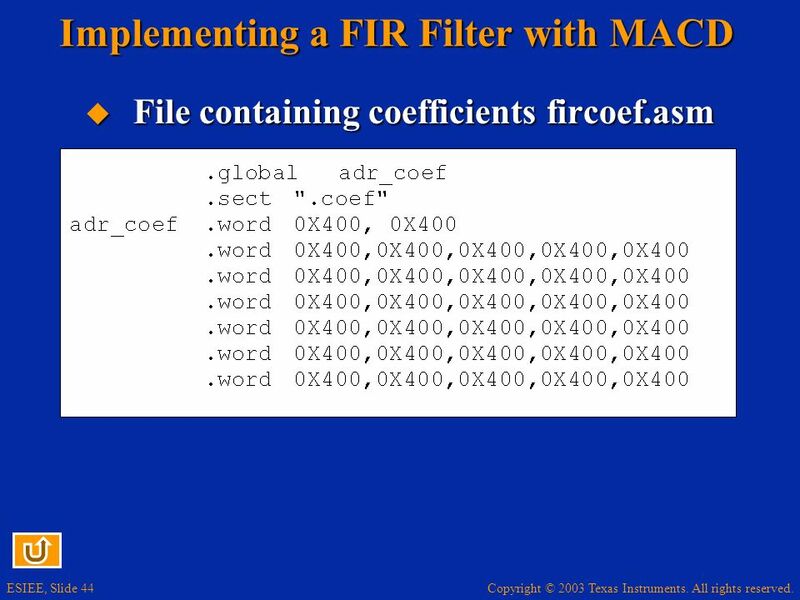 Same filter as in the preceding example, coefficients in section .coef (in program memory) in file fircoef.asm. 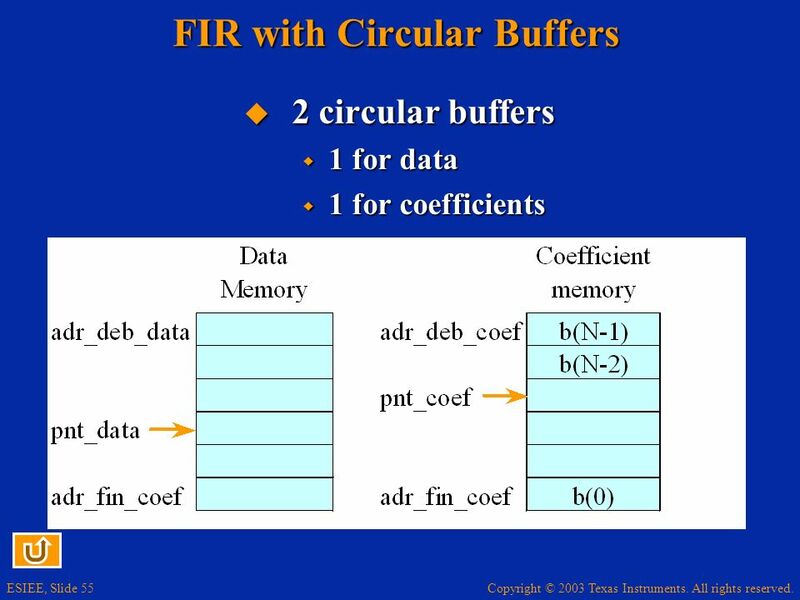 N=32 2 buffers are allocated in data memory for the coefficients and the data of the filters Start addresses must be multiple of 64. 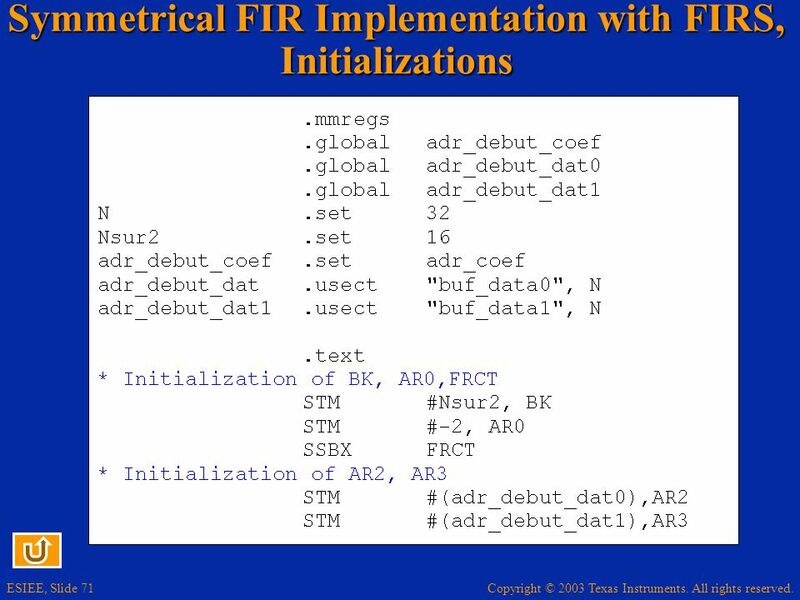 First step of program after initialization: Transfer coefficients from program to data memory from adr_coef to adr_debut_coef. 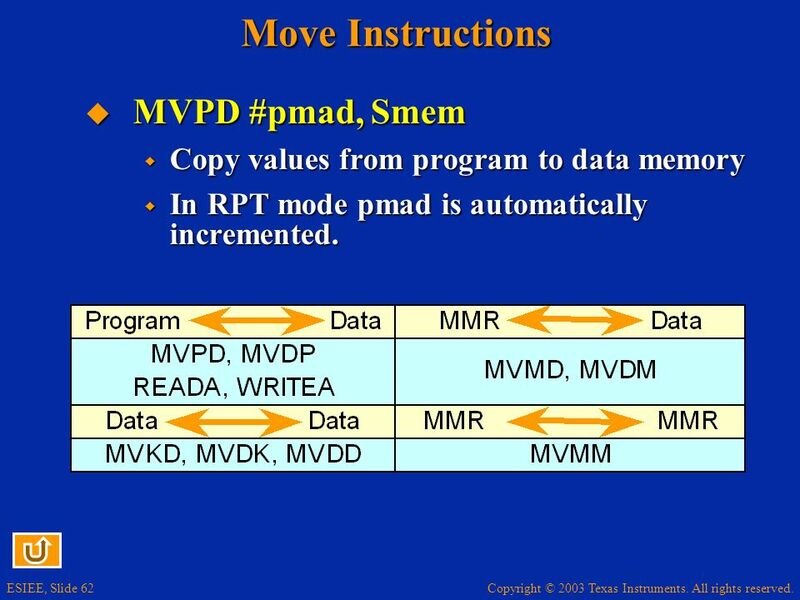 Copy values from program to data memory In RPT mode pmad is automatically incremented. 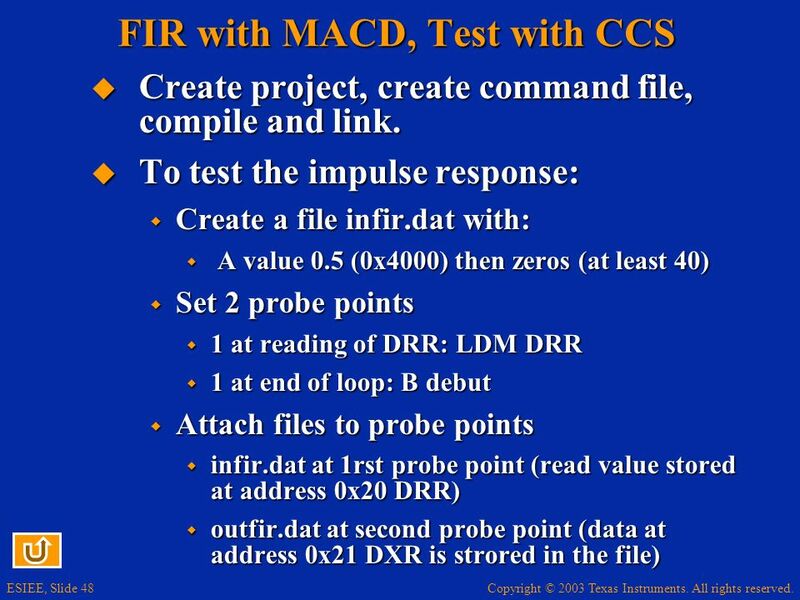 See files fircirc.asm and fircoef.asm for the test. 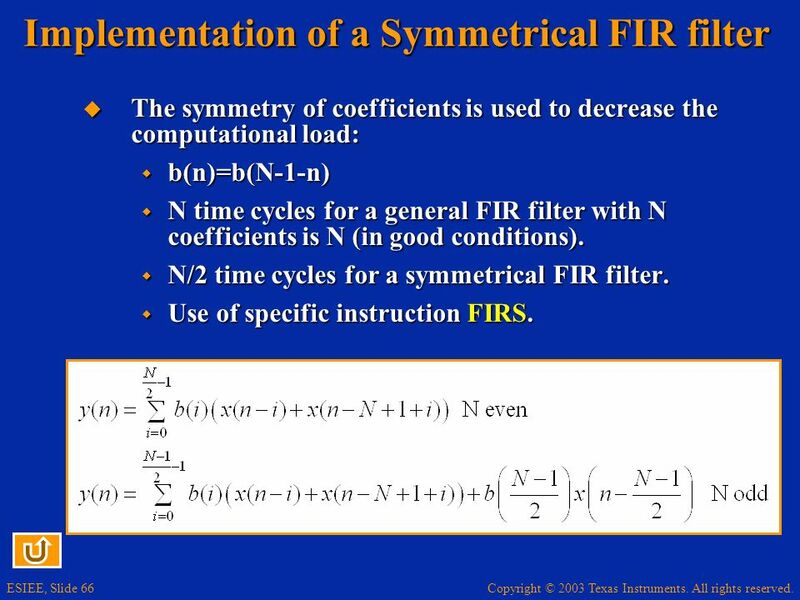 The symmetry of coefficients is used to decrease the computational load: b(n)=b(N-1-n) N time cycles for a general FIR filter with N coefficients is N (in good conditions). 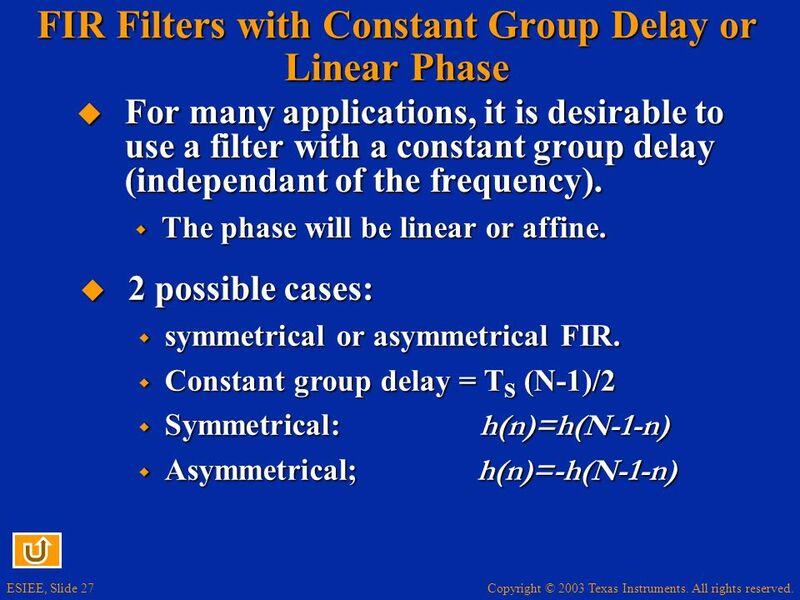 N/2 time cycles for a symmetrical FIR filter. Use of specific instruction FIRS. 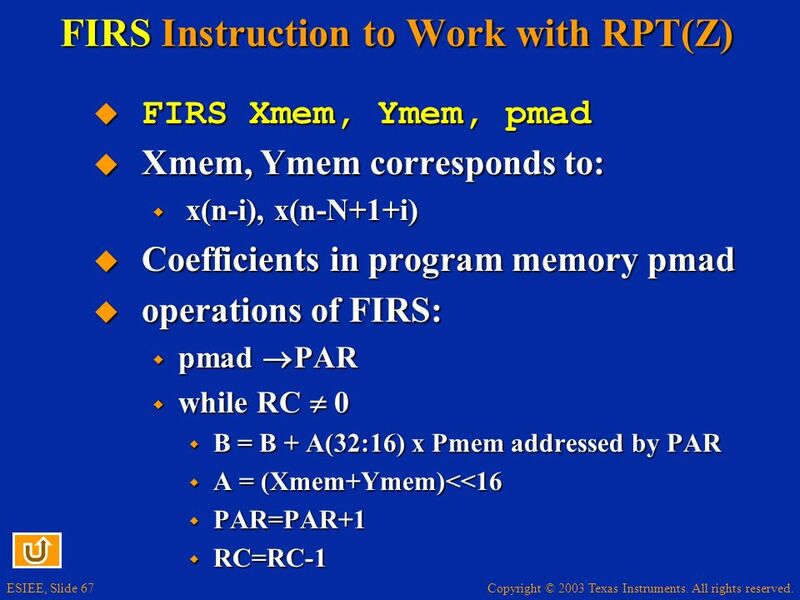 FIRS Xmem, Ymem, pmad Xmem, Ymem corresponds to: x(n-i), x(n-N+1+i) Coefficients in program memory pmad operations of FIRS: pmad PAR while RC  0 B = B + A(32:16) x Pmem addressed by PAR A = (Xmem+Ymem)<<16 PAR=PAR+1 RC=RC-1 3 operands: 2 in data, 1 in program. 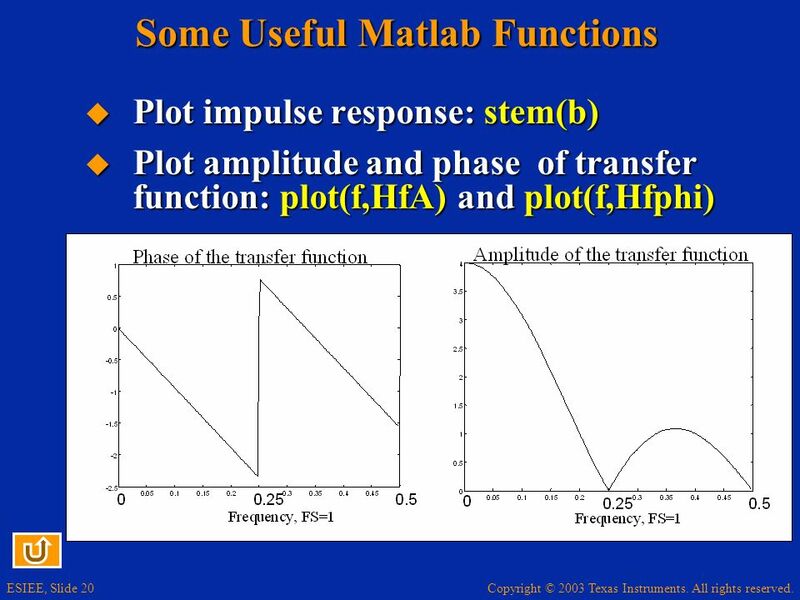 Uses the 2 Accumulators A and B. USes ALU and MAC units. 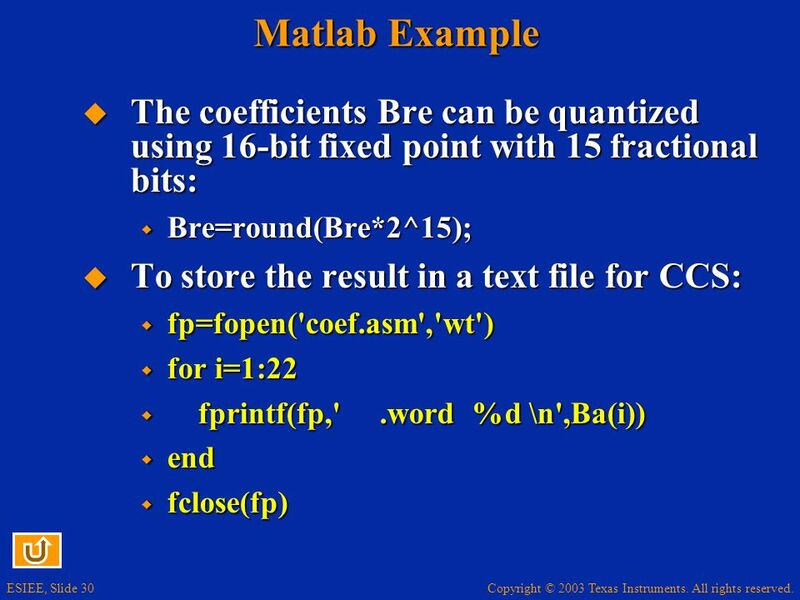 Multiplies the 17 MSB of A where is stored x(n-i)+x(n-N+1+i) by a value in program memory (ceoffficient) and add result to B. 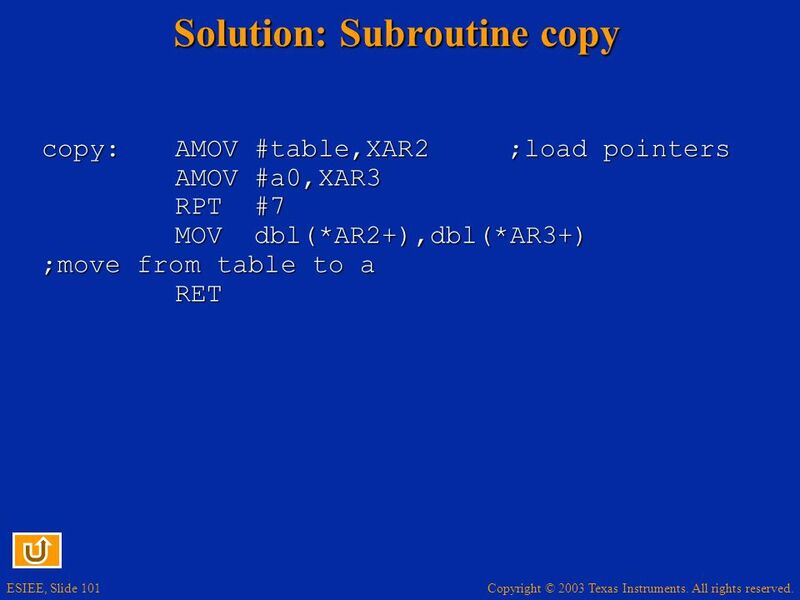 Then add Xmem (a new value of x(n-i)) to Ymem (a new value of x(n-N+1+i)) and store result in high part of accu A. 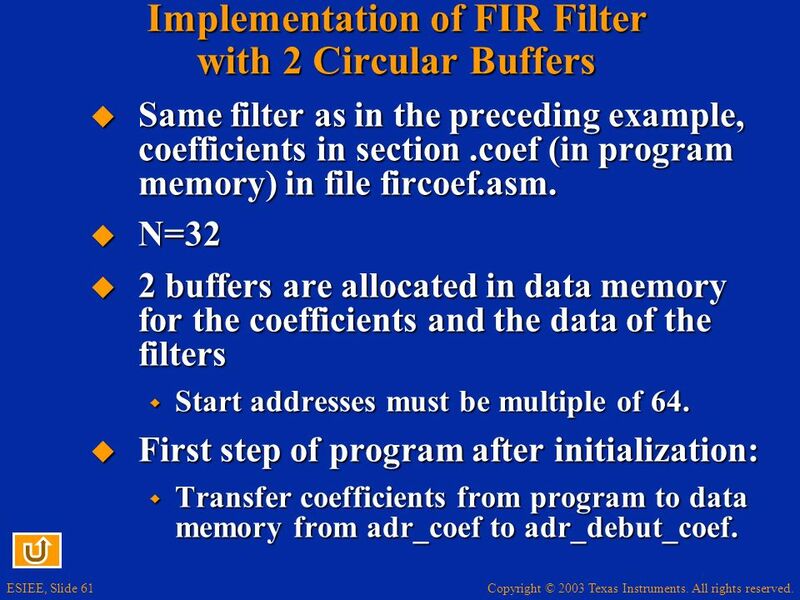 Increments program memory address to point to a new coeffcient. 1 time cycle in repeated mode when the pipeline is filled. Decrement the reprtition counter. 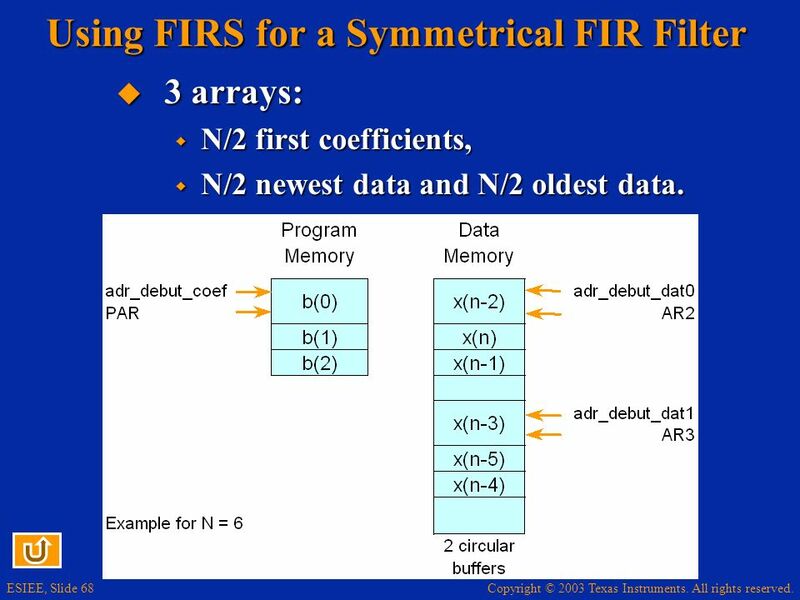 3 arrays: N/2 first coefficients, N/2 newest data and N/2 oldest data. 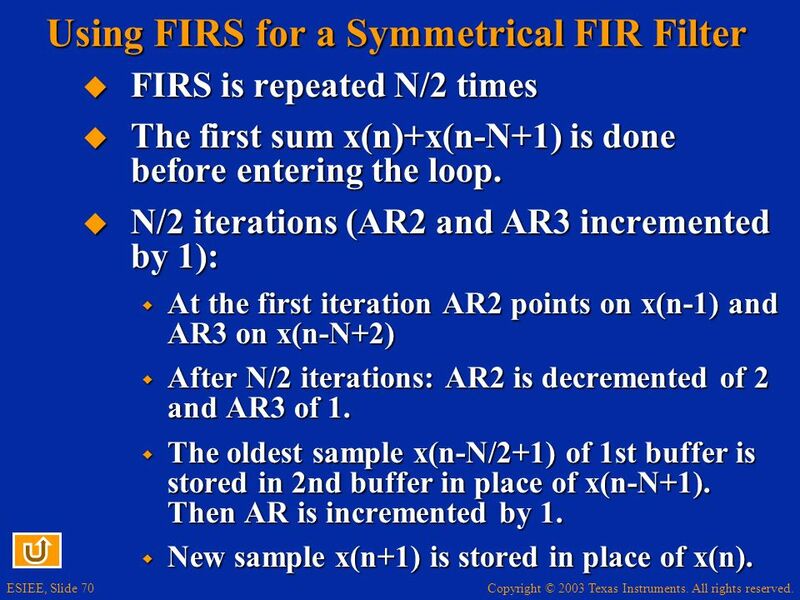 FIRS is repeated N/2 times The first sum x(n)+x(n-N+1) is done before entering the loop. N/2 iterations (AR2 and AR3 incremented by 1): At the first iteration AR2 points on x(n-1) and AR3 on x(n-N+2) After N/2 iterations: AR2 is decremented of 2 and AR3 of 1. The oldest sample x(n-N/2+1) of 1st buffer is stored in 2nd buffer in place of x(n-N+1). 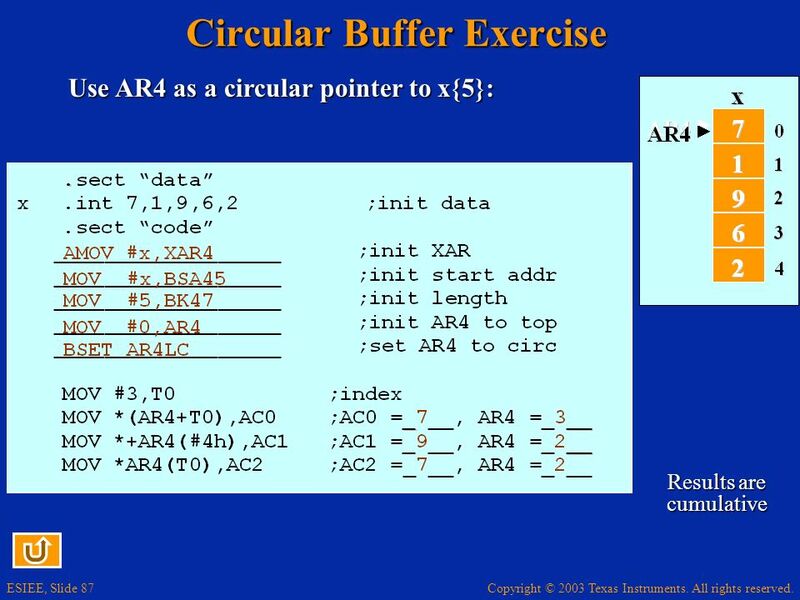 Then AR is incremented by 1. 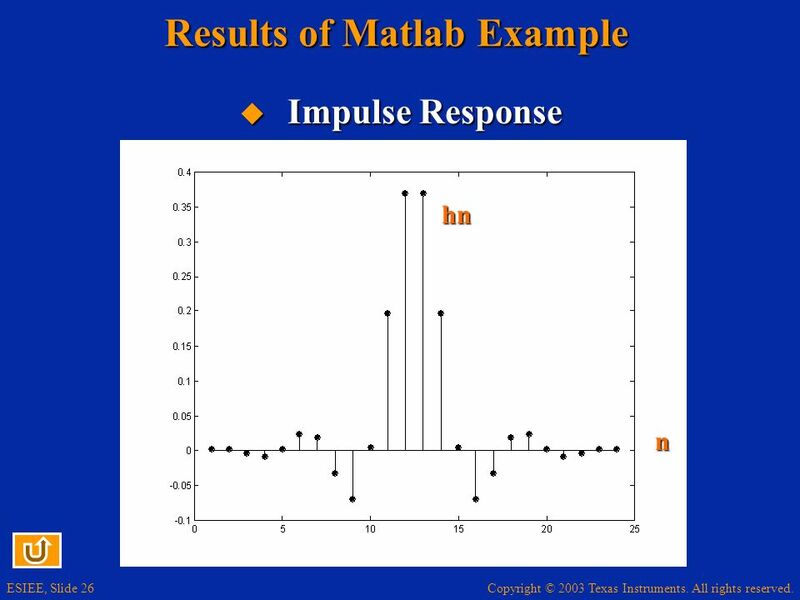 New sample x(n+1) is stored in place of x(n). 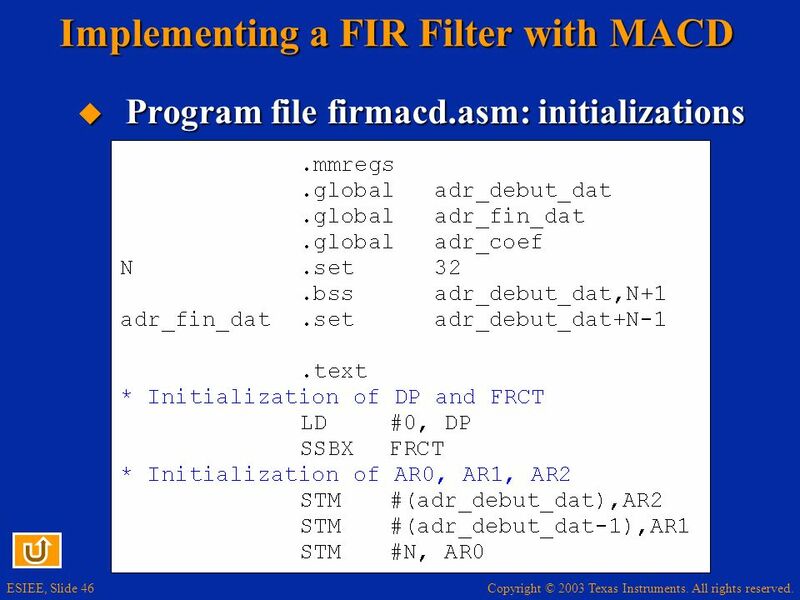 See files firsym.asm and fircoef.asm for the test. 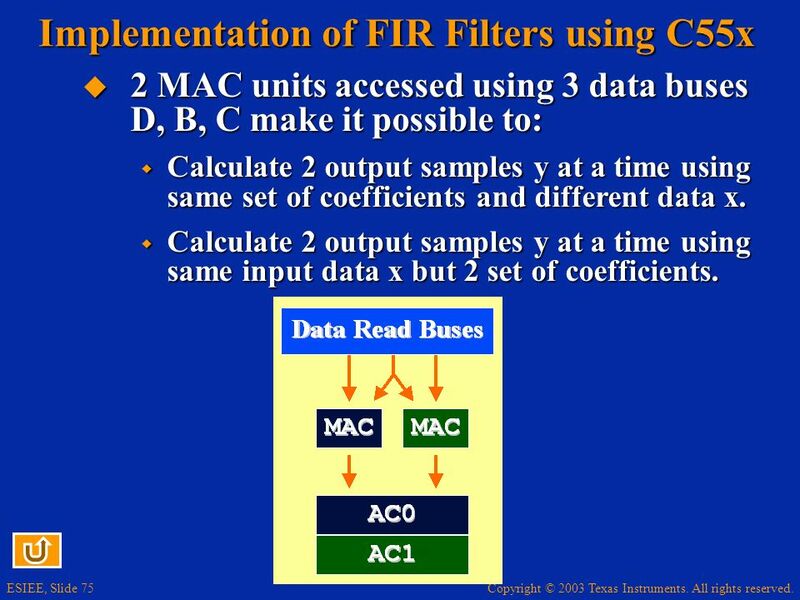 2 MAC units accessed using 3 data buses D, B, C make it possible to: Calculate 2 output samples y at a time using same set of coefficients and different data x. 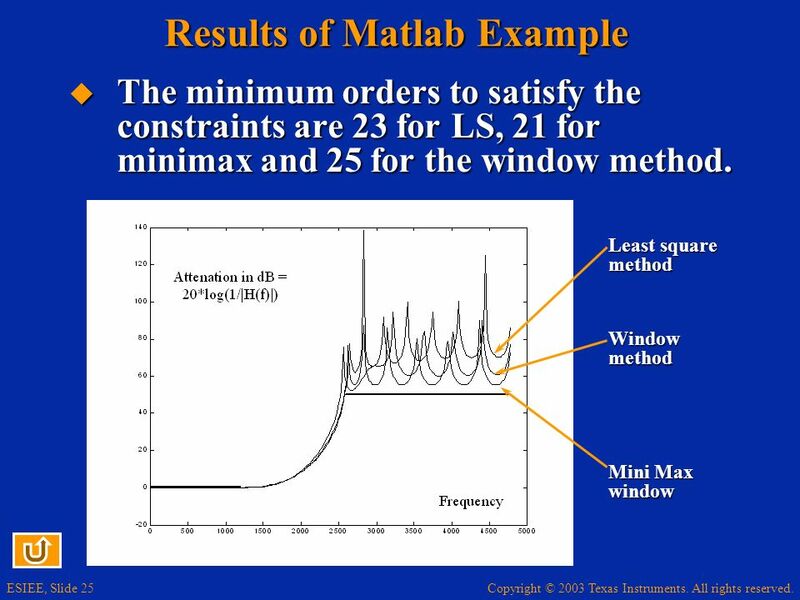 Calculate 2 output samples y at a time using same input data x but 2 set of coefficients. 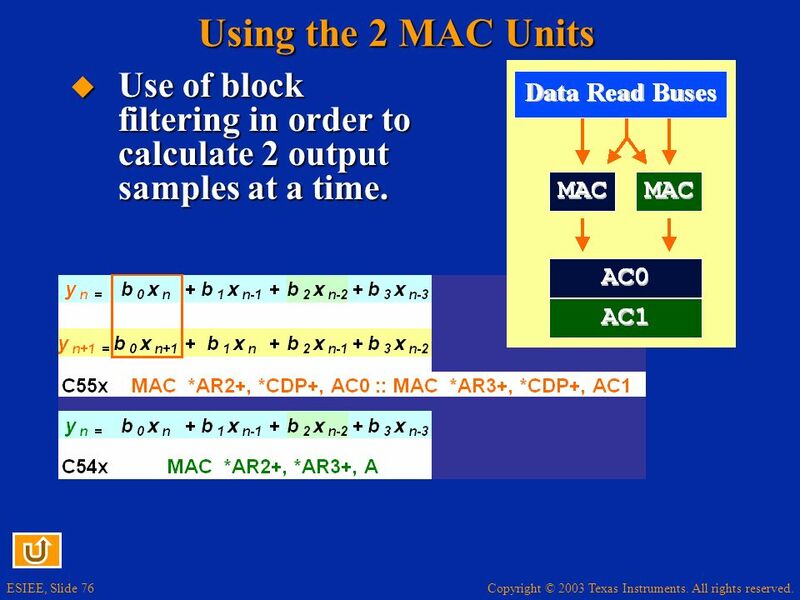 76 Using the 2 MAC Units Use of block filtering in order to calculate 2 output samples at a time. 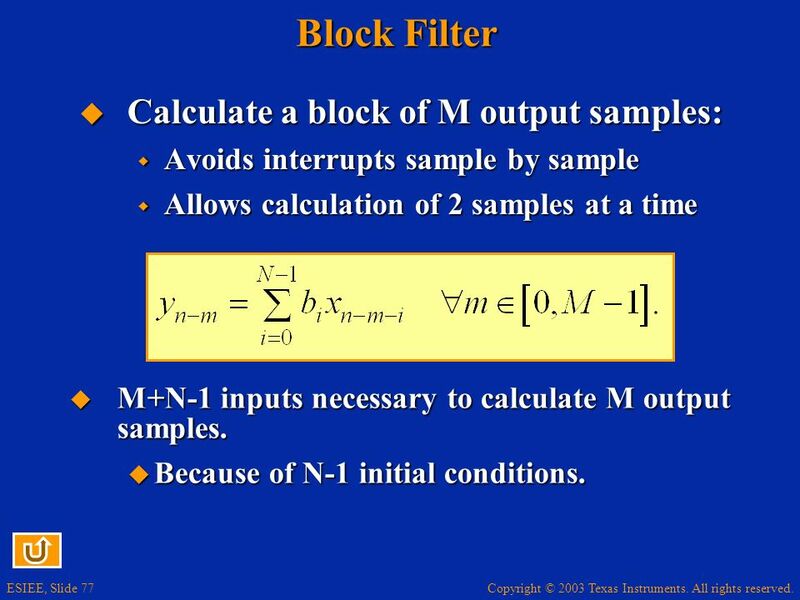 Avoids interrupts sample by sample Allows calculation of 2 samples at a time M+N-1 inputs necessary to calculate M output samples. 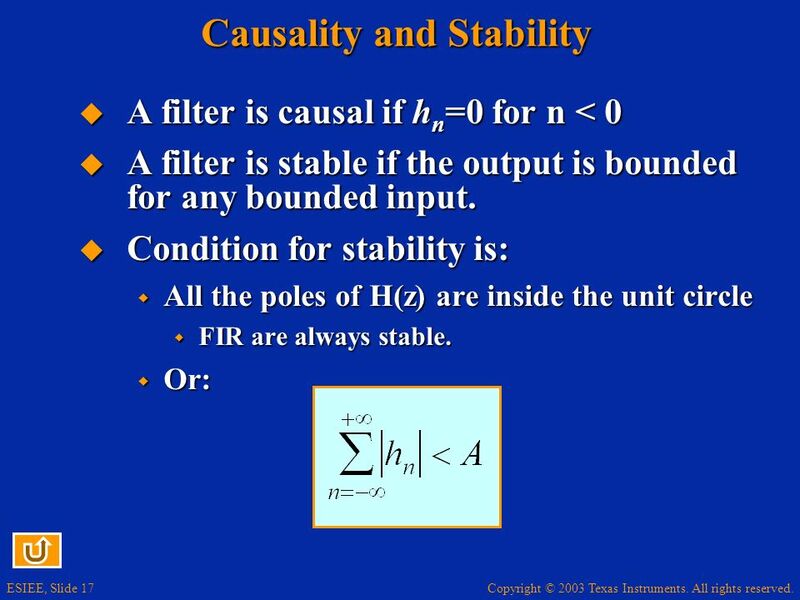 Because of N-1 initial conditions. 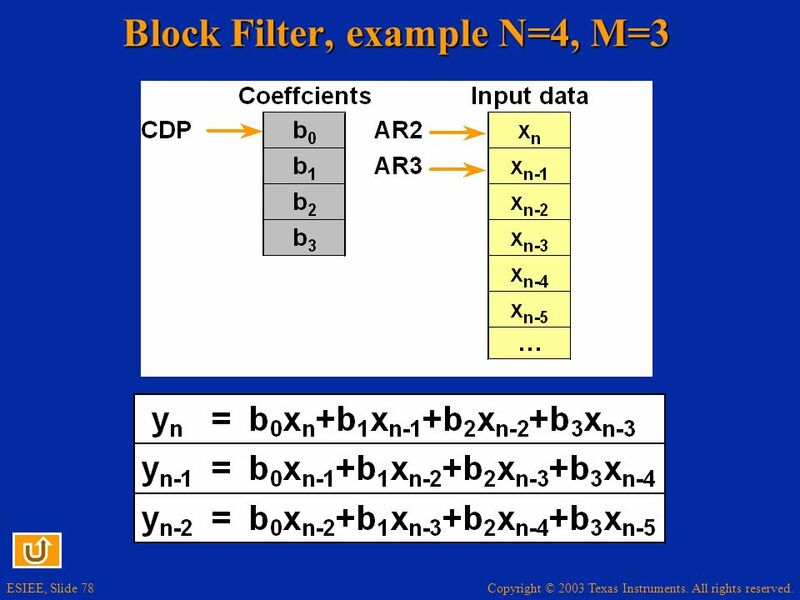 On coefficients and on m Coefficients accessed by CDP: CDP (Cmem) modifications limited to: *CDP, *CDP+, *CDP-, *(CDP+T0). 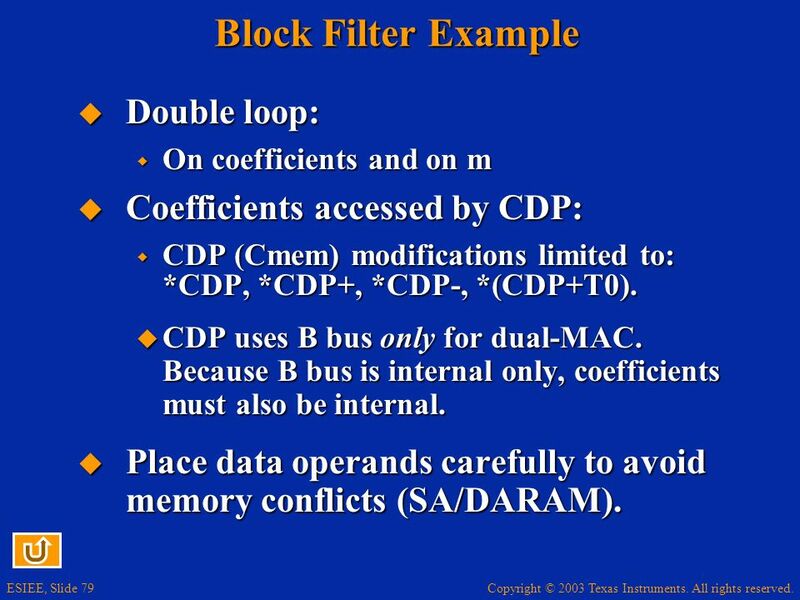 CDP uses B bus only for dual-MAC. 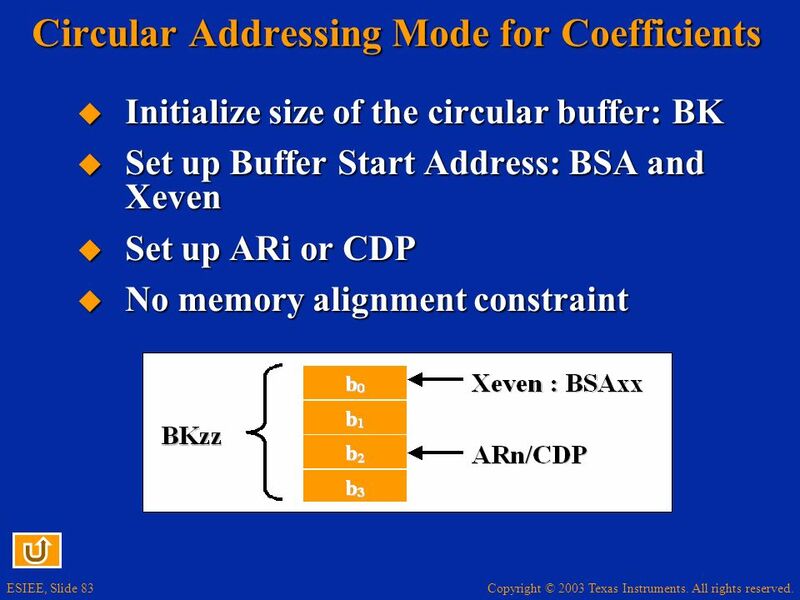 Because B bus is internal only, coefficients must also be internal. 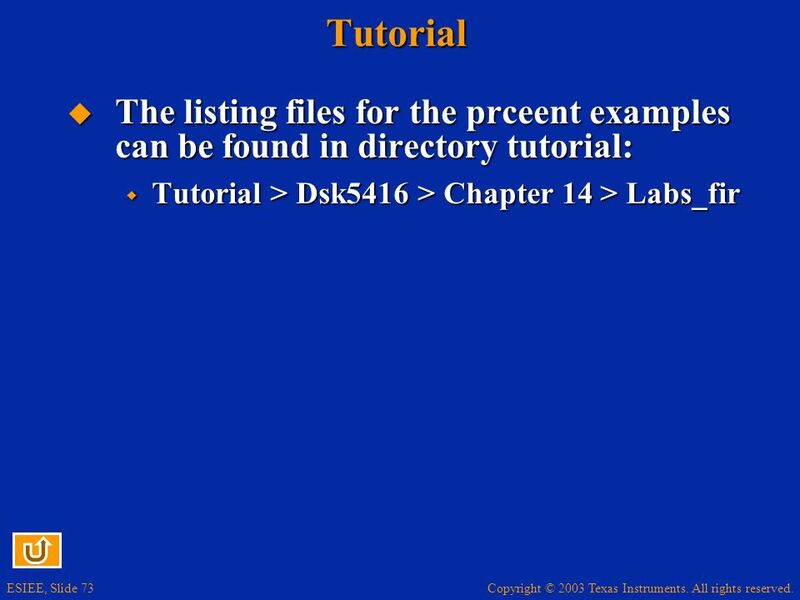 Place data operands carefully to avoid memory conflicts (SA/DARAM). 80 Using Dual MAC The products bi xn-i and bi xn-i-1 are done in parallel. As they use the same coeffcicient bi, 3 buses are sufficient. 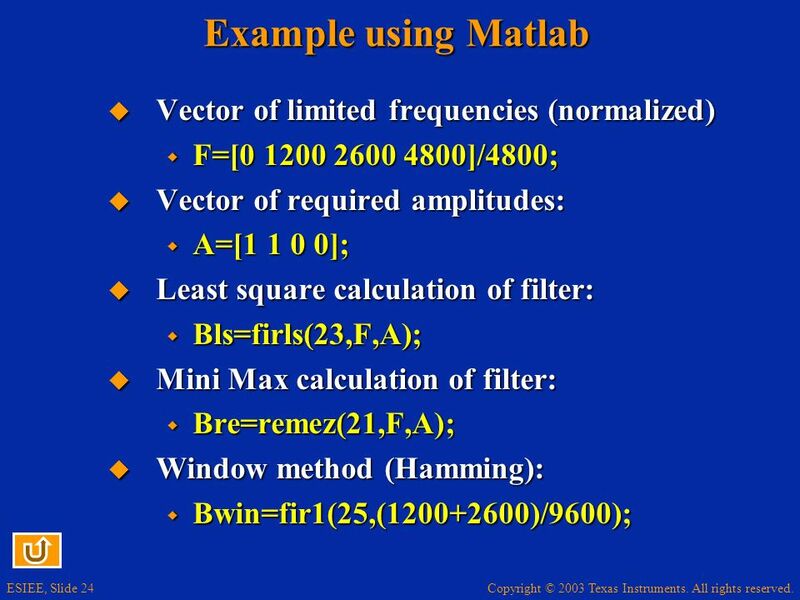 The common coefficients and 2 sample data are read in parallel. 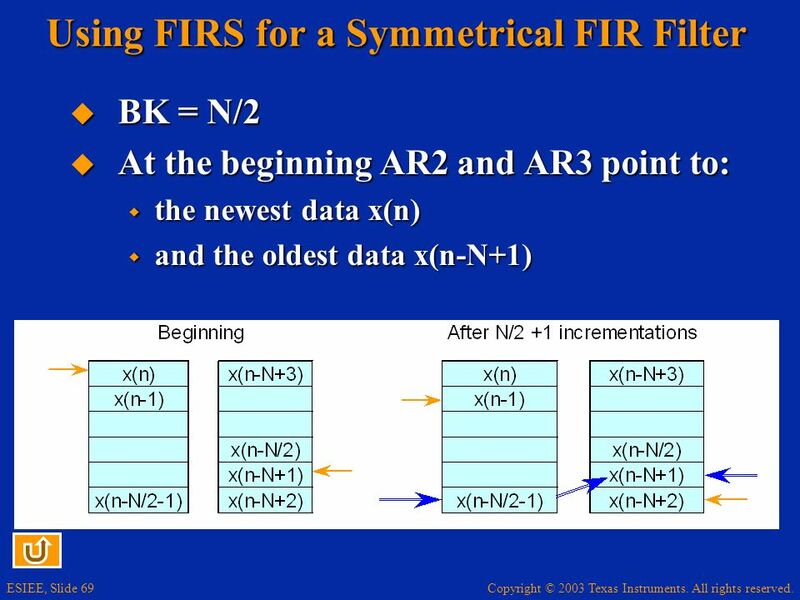 The register CDP points to the coefficient bi and the 2 ARi (here AR2 and R3) points to the data xn-i and bi xn-i-1. 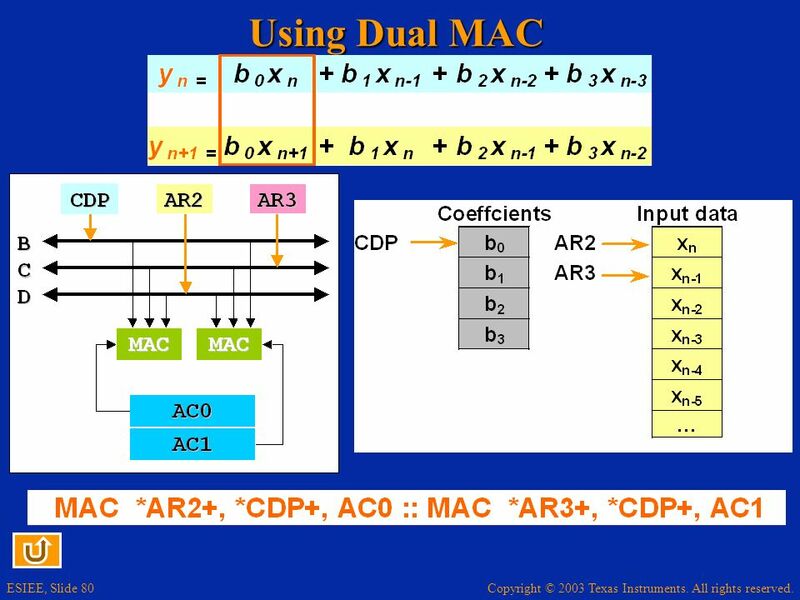 CDP uses B bus only for dual-MAC. 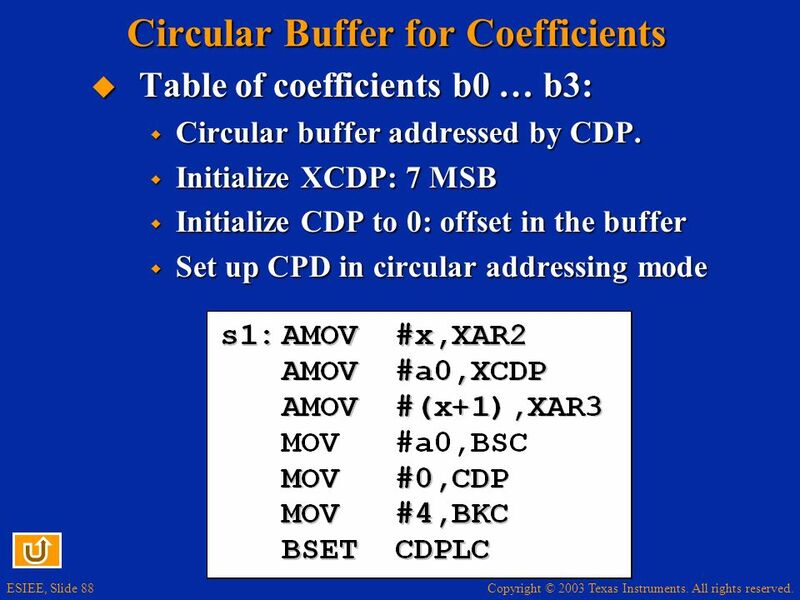 Because B bus is internal only, coefficients must also be internal. 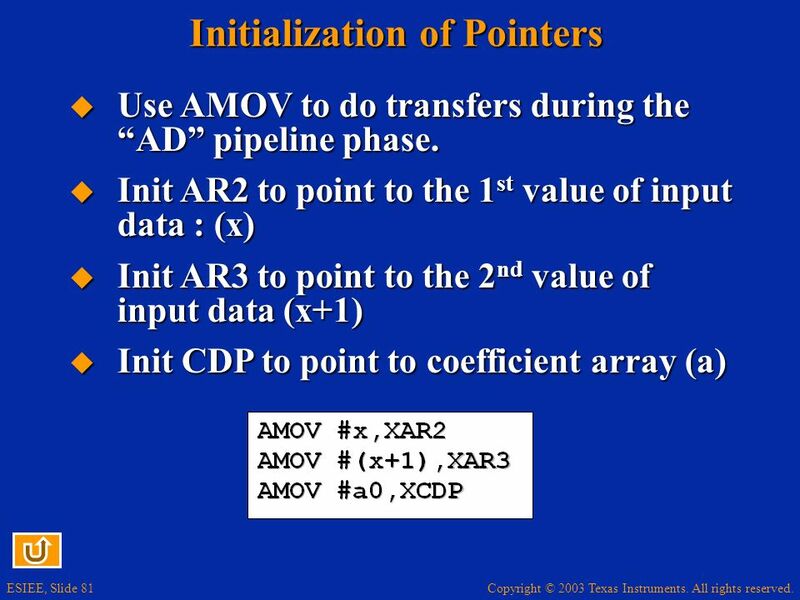 CDP (Cmem) modifications limited to: *CDP, *CDP+, *CDP-, *(CDP+T0). 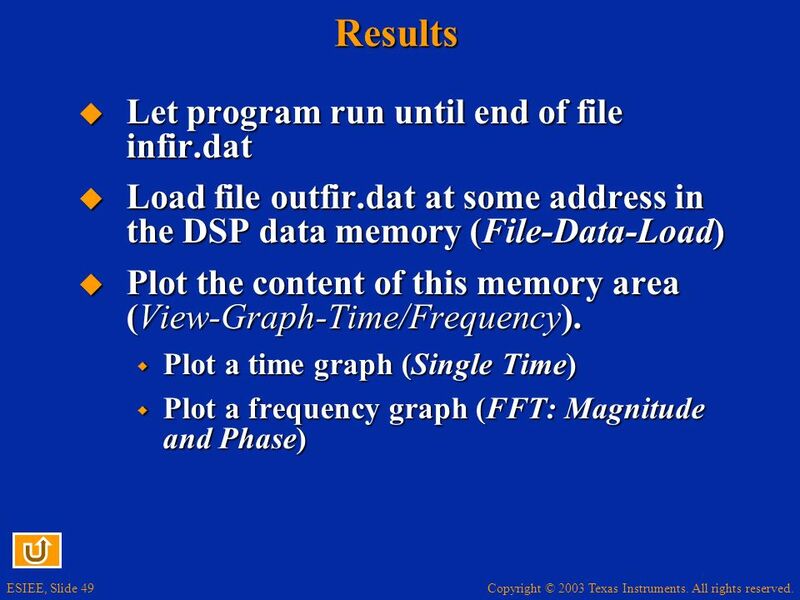 Place data operands carefully to avoid memory conflicts (SA/DARAM). The 2 products are done at the same time in the 2 MAC units. They are accumulated in the separate accumulators AC0 and AC1. 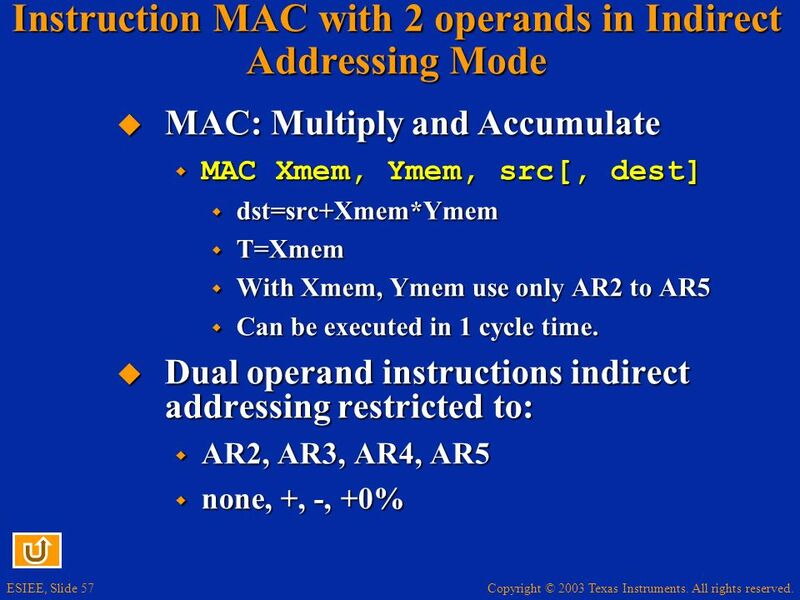 In the example instruction, 2 elementary MAC instructions are done in parallel. 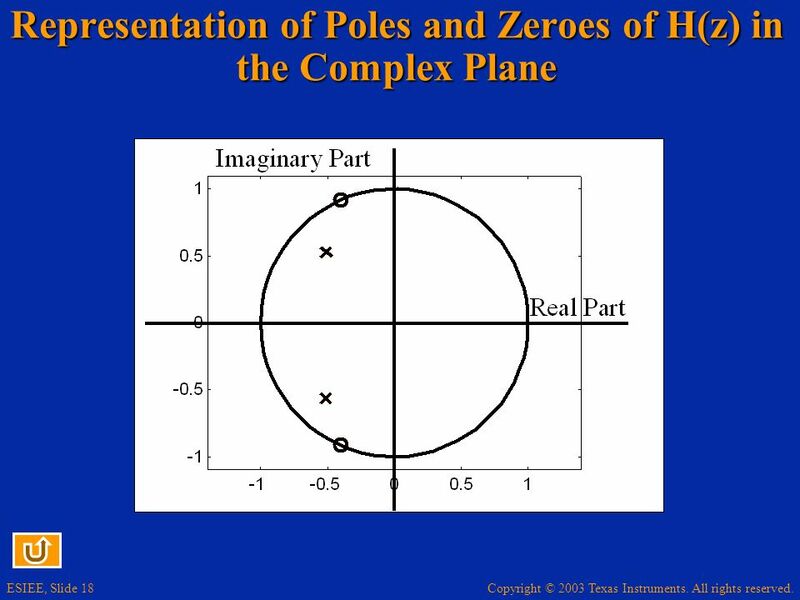 It is represented by the :: symbol. 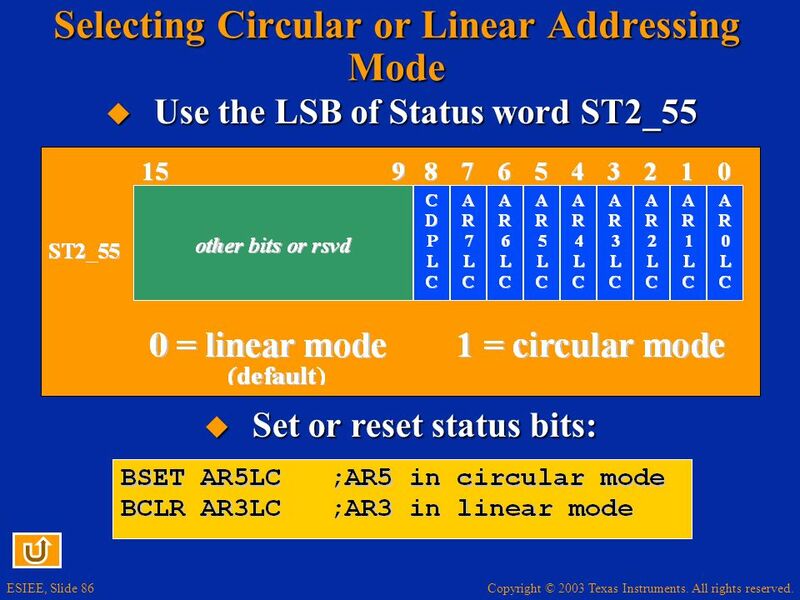 Use the LSB of Status word ST2_55 Set or reset status bits: If BK=0 or BK=FFFF, linear = circular. 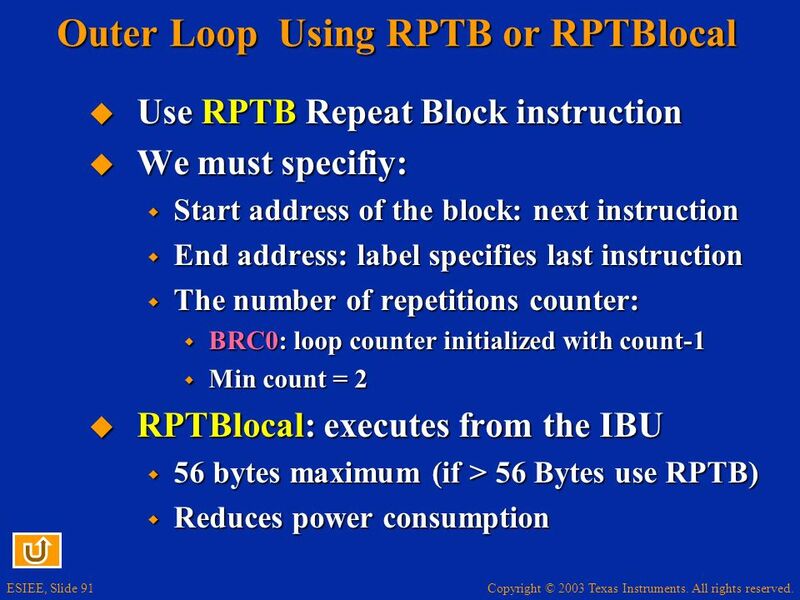 Use RPTB Repeat Block instruction We must specifiy: Start address of the block: next instruction End address: label specifies last instruction The number of repetitions counter: BRC0: loop counter initialized with count-1 Min count = 2 RPTBlocal: executes from the IBU 56 bytes maximum (if > 56 Bytes use RPTB) Reduces power consumption RPTBLOCAL limitation is 56 bytes, but the IBU can contain up to 64 bytes. Where did the other 8 go? Instruction/IBU alignment. 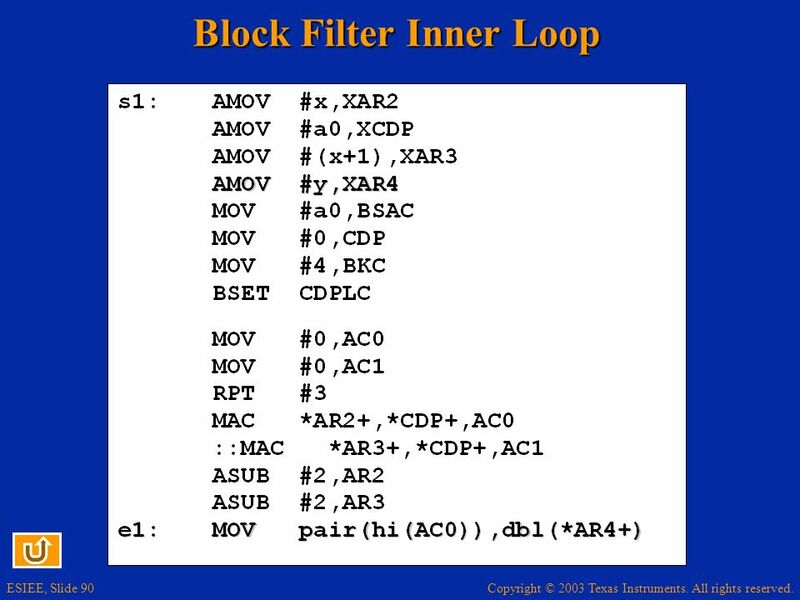 The fetch h/w always accesses an ALIGNED 4-byte packet. 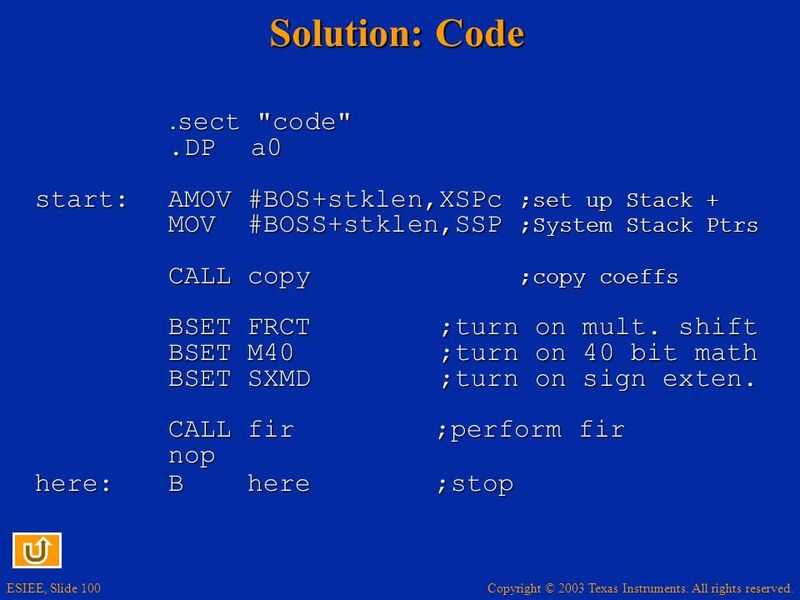 So, if the first instruction in the RPTBLOCAL is the 4th byte, you lose 3 bytes. 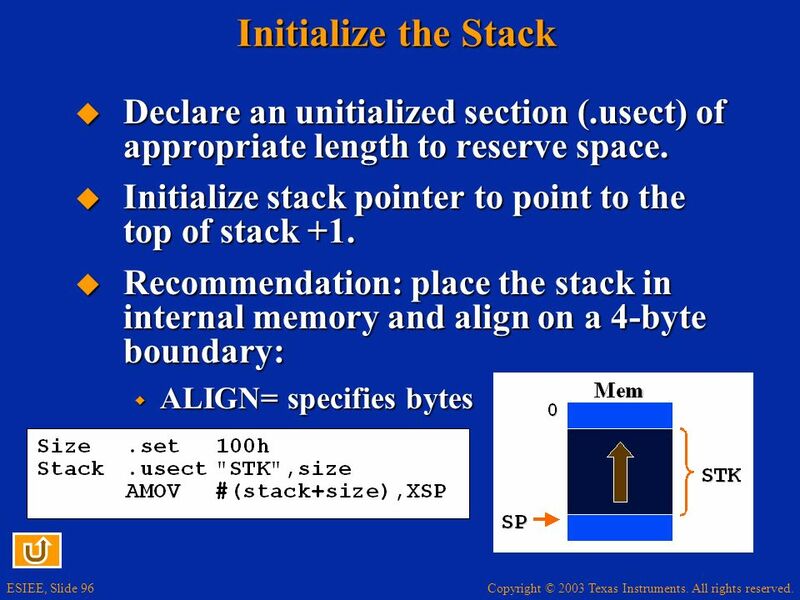 Also, if the last instruction is the first byte of a 4-byte packet, you lose another 3. 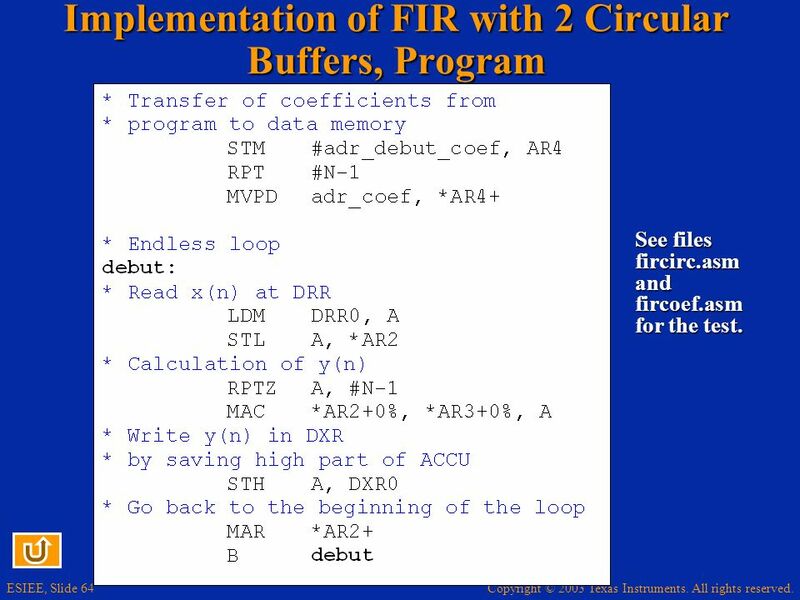 The other two are taken by the RPTBLOCAL instruction itself for a total of 8 bytes. 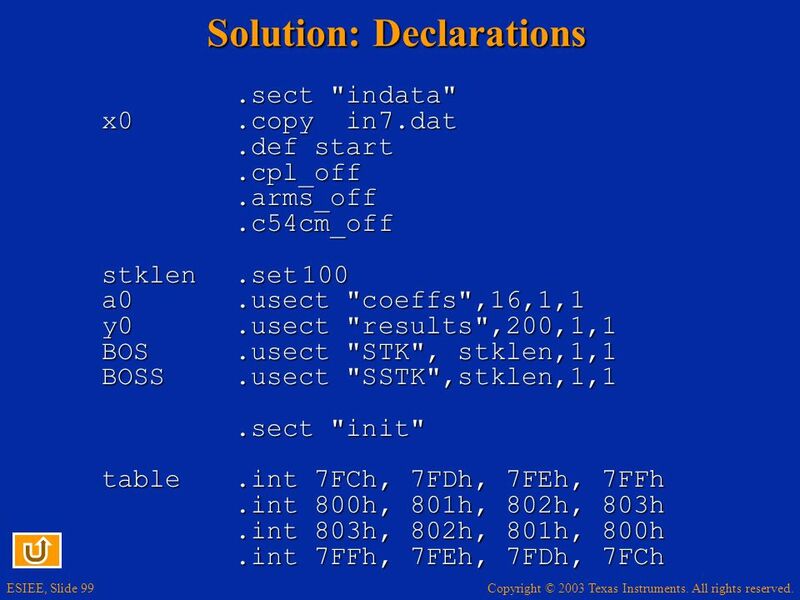 Now, the restriction of 56 bytes is NOT a hard #. 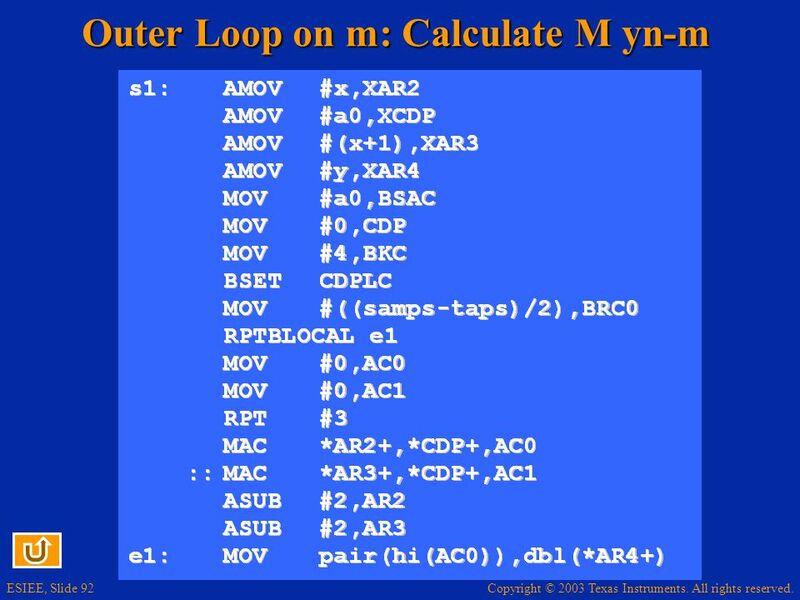 It’s actually 56 bytes plus or minus 3 bytes depending on WHAT is inside the loop. 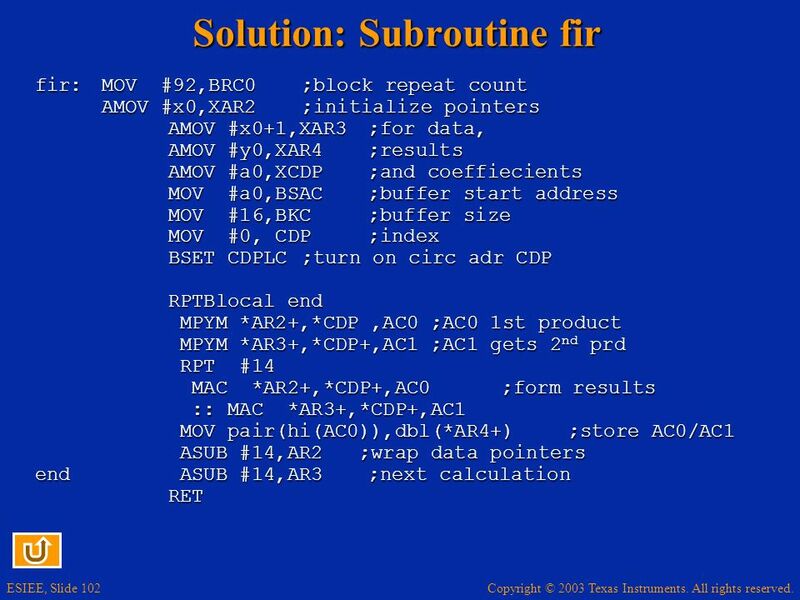 Another KEY here is that the RPTBLOCAL (as well as the RPTB) instructions use the address of the LAST instruction in the block, REGARDLESS of how many bytes the instruction is. This is slightly different than 54x where we used the “end-1” concept. Please note that it looks like we are loading N into BRC0 when it should be N minus 1. 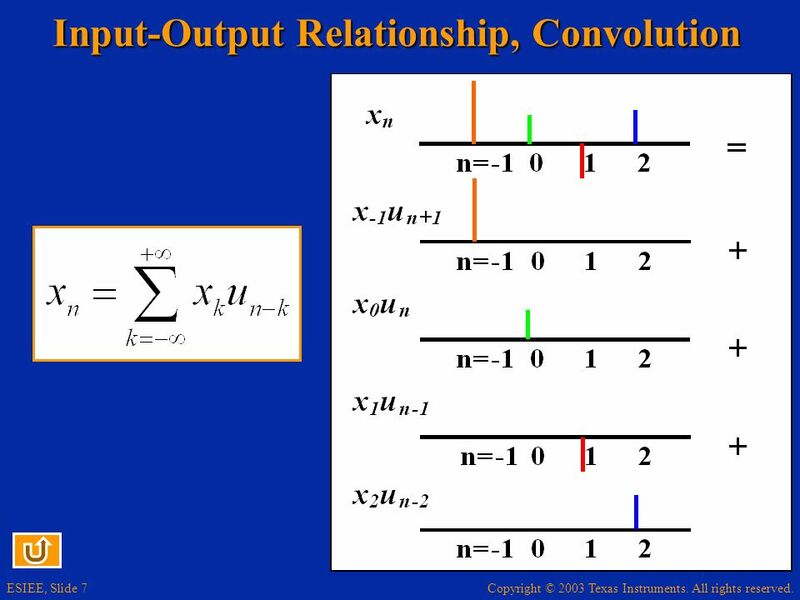 However, remember how the #outputs is determined: samples-taps+1. So, samps-taps+1 (-1) = samps-taps. And the value is divided by 2 because we calculate 2 samples at a time. 2 levels supported using BRC0 (outer) and BRC1/BRS1 (inner) No saving of registers required for nested block repeat. 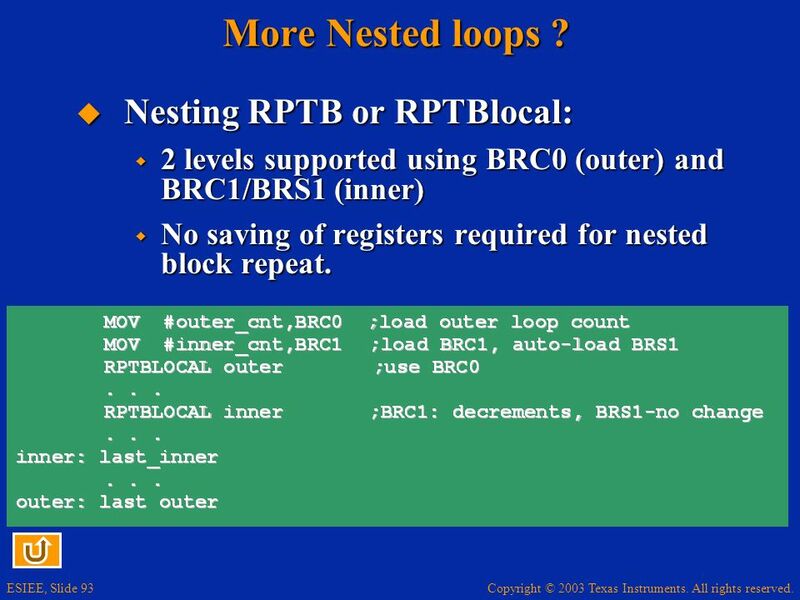 Block Repeat vs. Local Repeat: BRC0 is always used for the outer loop. BRC1/BRS1 are always used for the inner loop. BRC1 is loaded ONCE outside both loops. When BRC1 is initialized, BRS1 is auto-loaded with the same value. Then, each time the inner repeat instruction is executed BRC1 is loaded with the contents of BRS1. BRC1 decrements normally inside the inner loop. This allows you to load both repeat counters outside the loops. 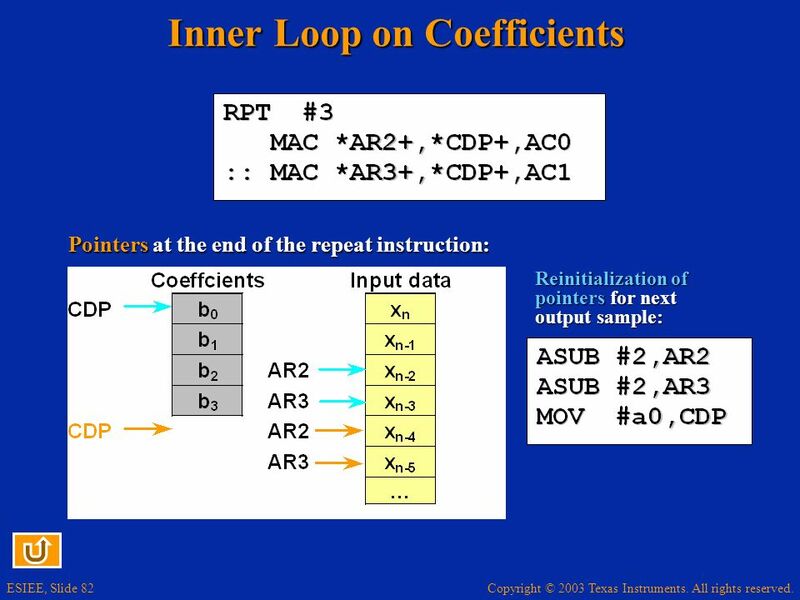 Both inner and outer loops have their own start and end addresses (RSA0/1, REA0/1). Therefore, no saving of registers is required. RPTBLOCAL and RPTB can be used interchangeably. So, you can use two locals and two blocks or mix ‘em. 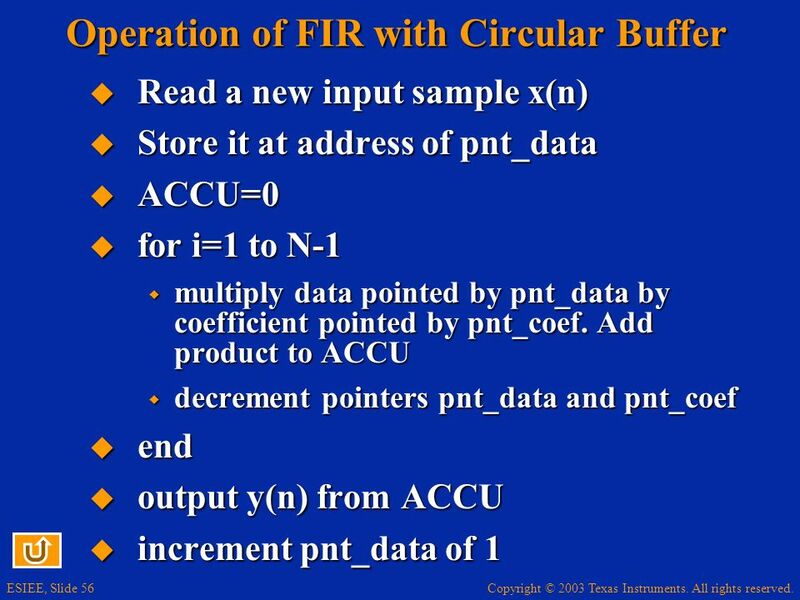 Typically, if they are mixed, a RPTB will be used as the outer and RPTBLOCAL will be used as the inner because RPTBLOCAL loops execute out of the IBU. 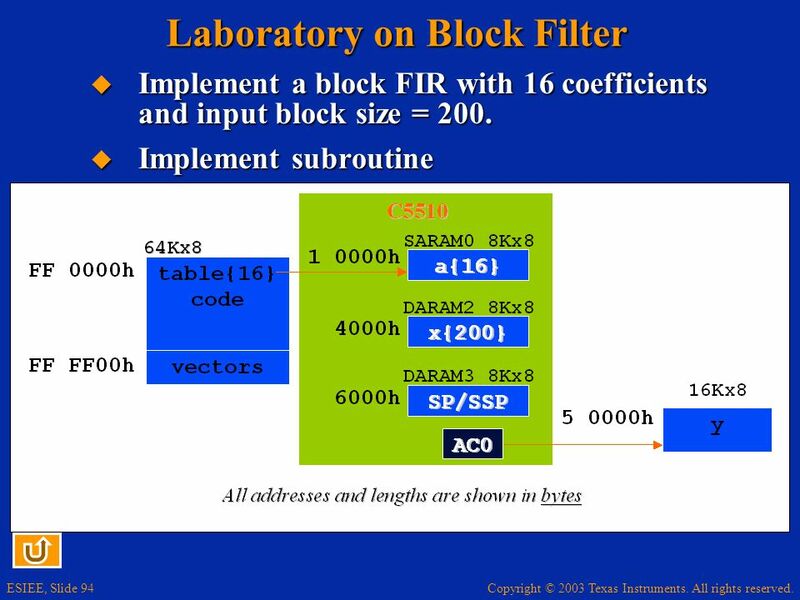 However, if the total size of BOTH blocks is still less than 56bytes, you can surely use TWO RPTBLOCALs. 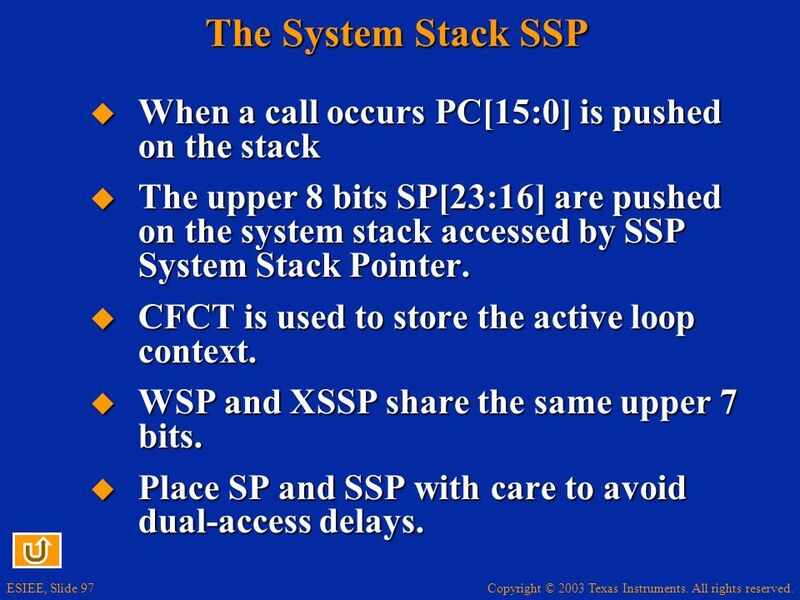 97 The System Stack SSP When a call occurs PC[15:0] is pushed on the stack The upper 8 bits SP[23:16] are pushed on the system stack accessed by SSP System Stack Pointer. 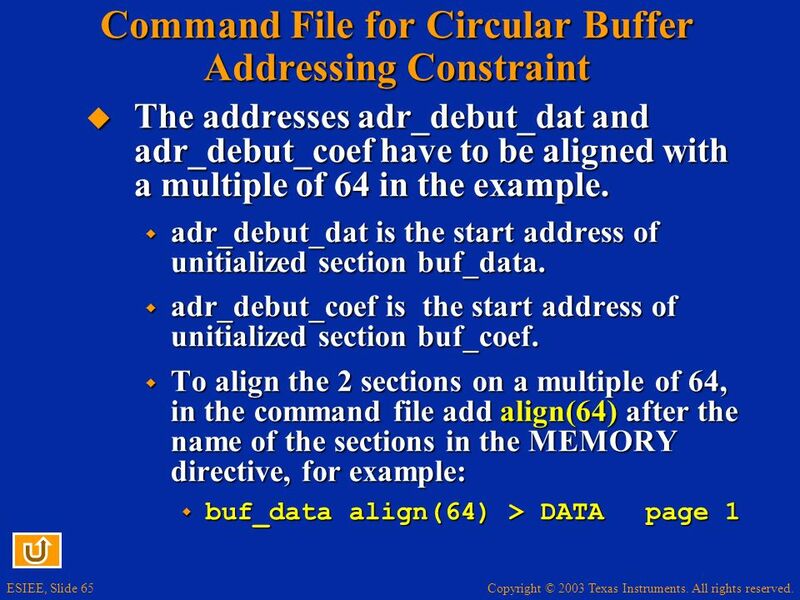 CFCT is used to store the active loop context. 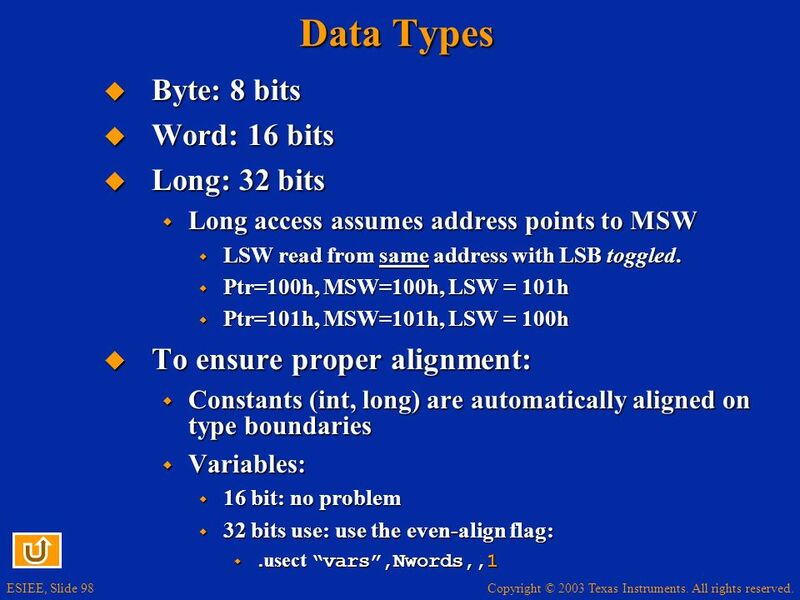 WSP and XSSP share the same upper 7 bits. Place SP and SSP with care to avoid dual-access delays. Regarding the “potential delays”, this can occur if the SP and SSP end up in the same block of SARAM. Remember, the values are written to the SP and SSP at the same time – two writes (and then two reads later on). Given that the SP and SSP HAVE to be on the same 64Kword data page (because they share the same upper 7 bits), it makes it “easier” to put them near each other. 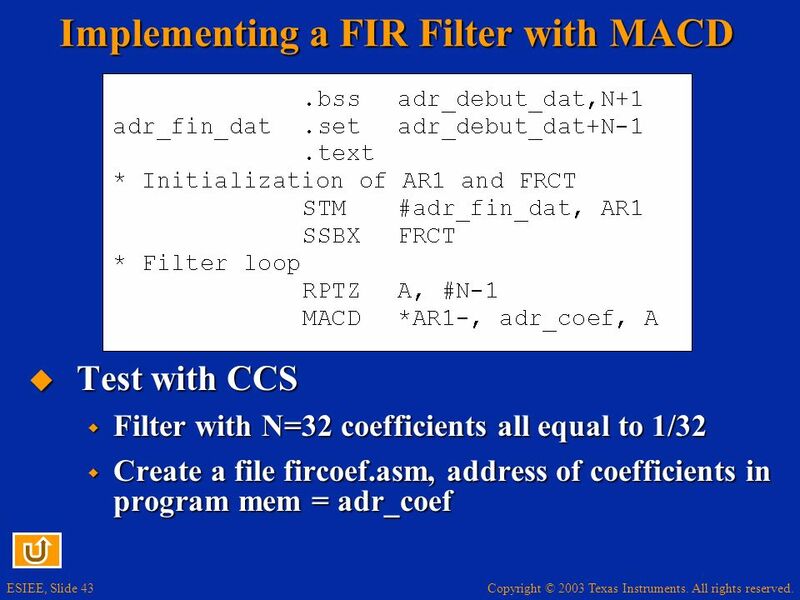 CFCT; there is a bit that indicates that “repeat single is active”. 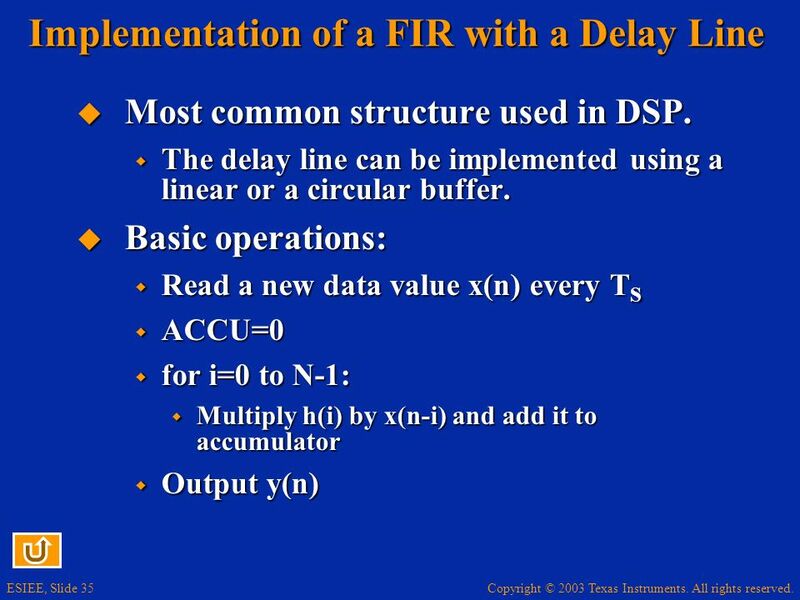 This allows a repeat single to be interruptible. The stack modes will be clarified in the module on interrupts where the reset vector is covered. 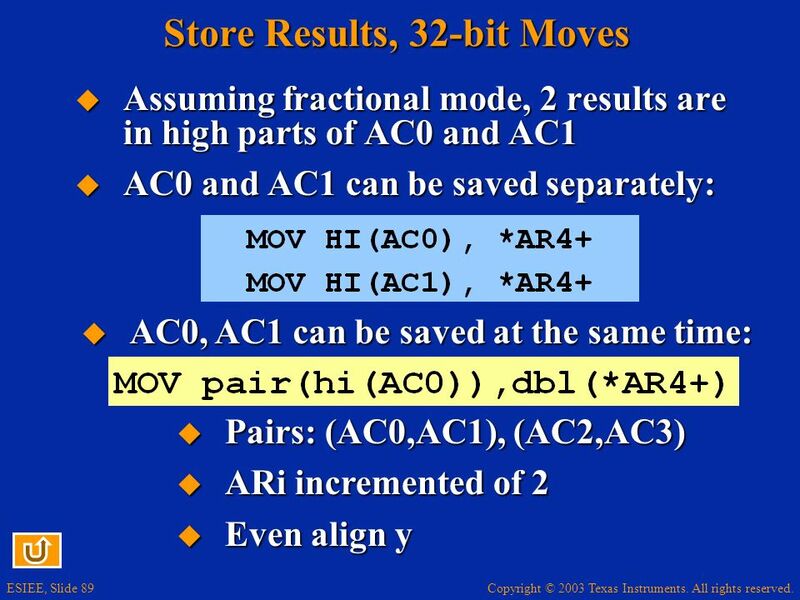 The default stack mode is the 32-bit mode where RETA is not used. So, when the students do their labs, they won’t know the difference. 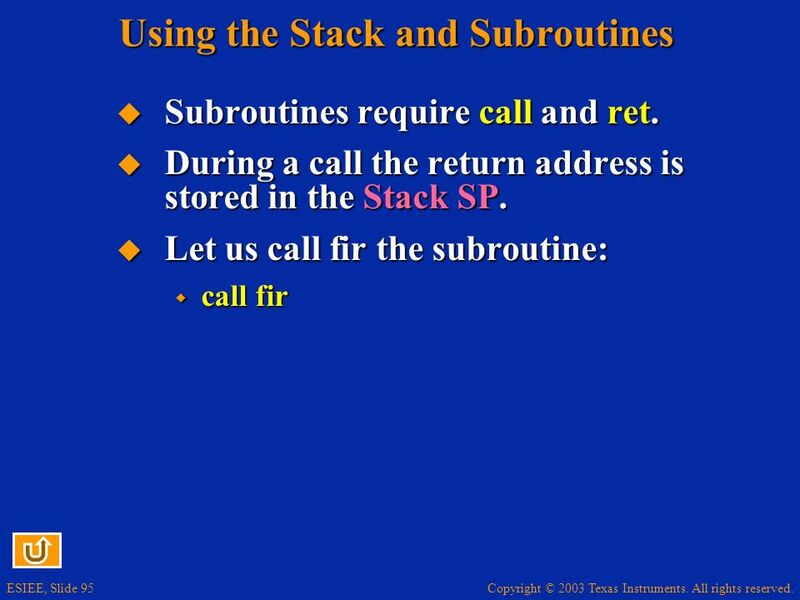 However, in the interrupts lab, they will investigate the different stack modes and the material will discuss exactly what happens in each mode. 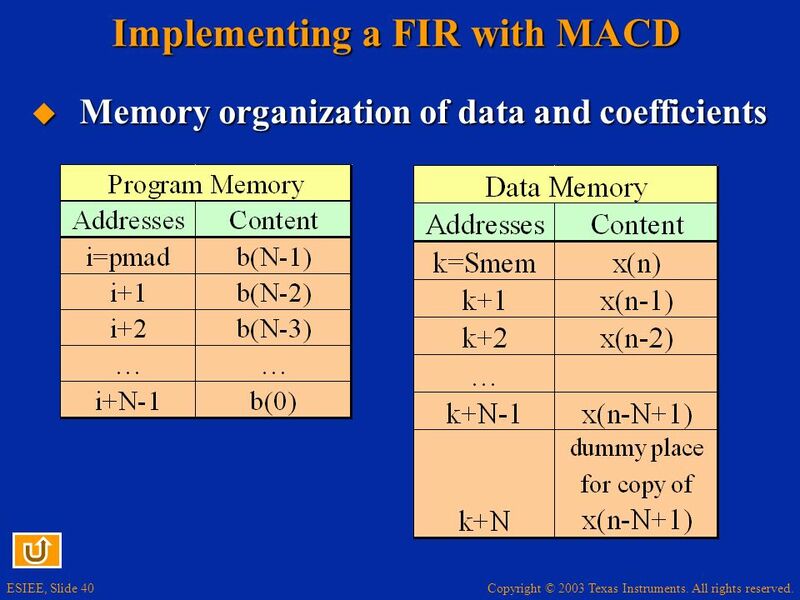 FIRSADD Xmem,Ymem, coef,Acx,Acy Acy = Acy + (Acx x (*CDP)) || Acx = Xmem + Ymem For symmetrical FIR FIRSSUB Xmem,Ymem, coef,Acx,Acy || Acx = Xmem - Ymem For anti-symmetrical FIR If performing a block FIR, dual MAC has better performance than FIRS. 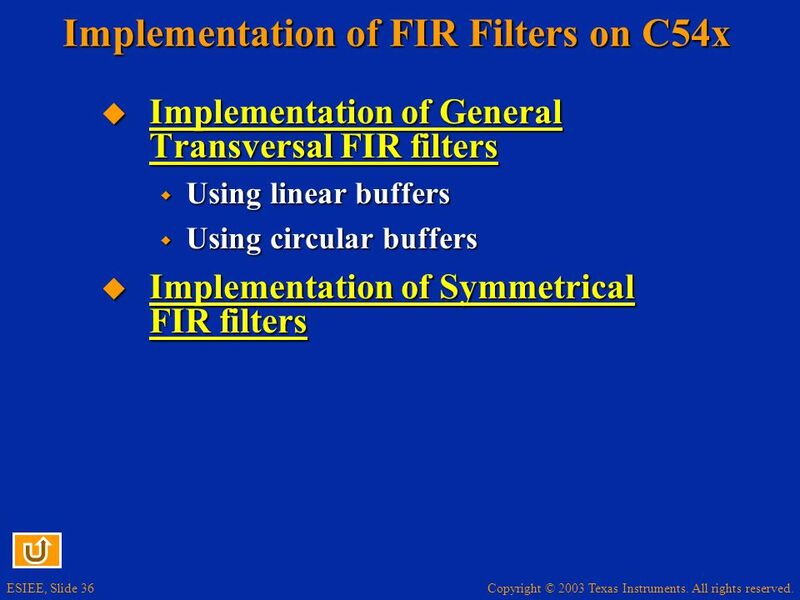 A design consideration for migration from ‘C54x. 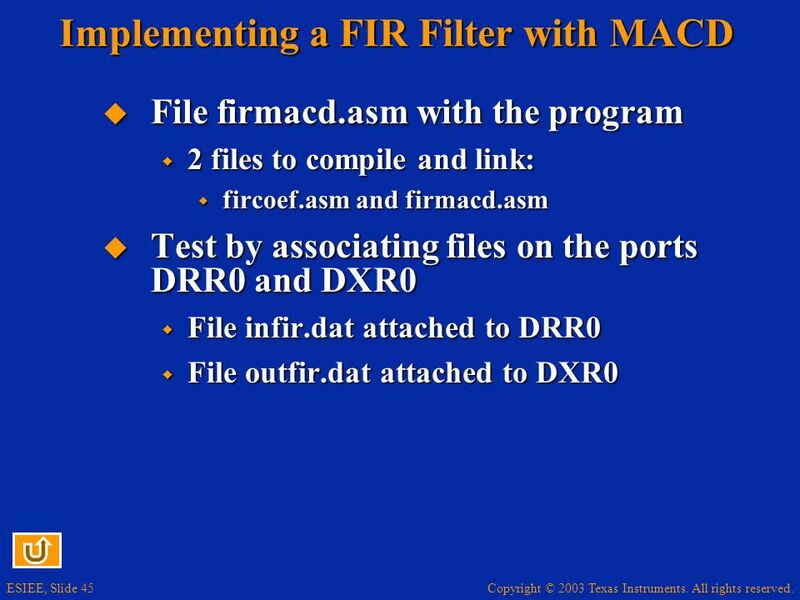 If you’re using a block FIR, a dual-MAC beats FIRS. On the 54x, FIRS was faster. But on the 55x, having the dual-MAC basically obsoletes the FIRS instruction. 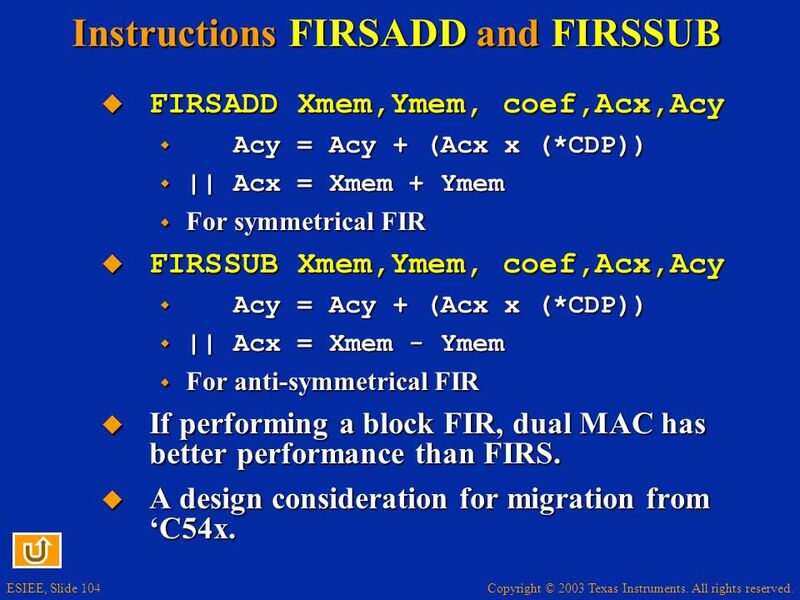 For migration from the 54x (which has the SAME benchmark - 2 taps/cycle), the advantage of FIRSADD is lower power. 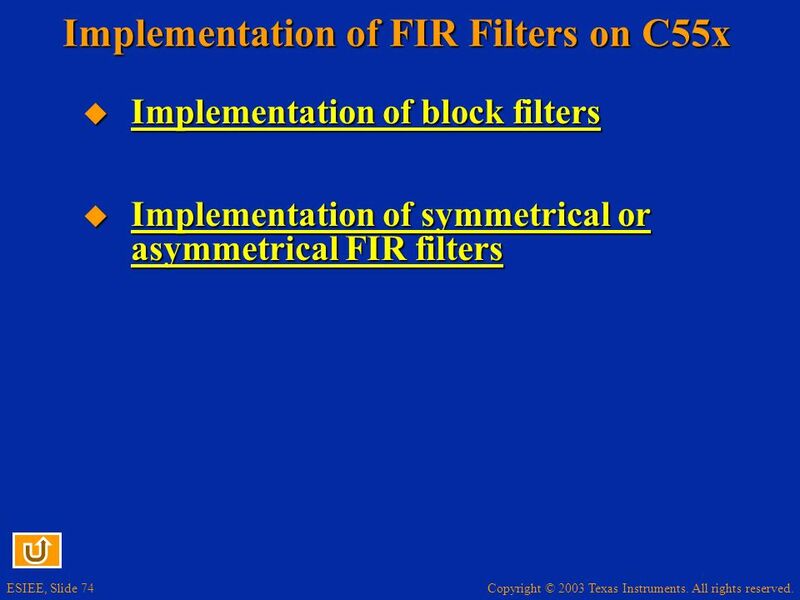 Well suited for block filtering and 2 taps per cycle time instead of 1 (for large N). 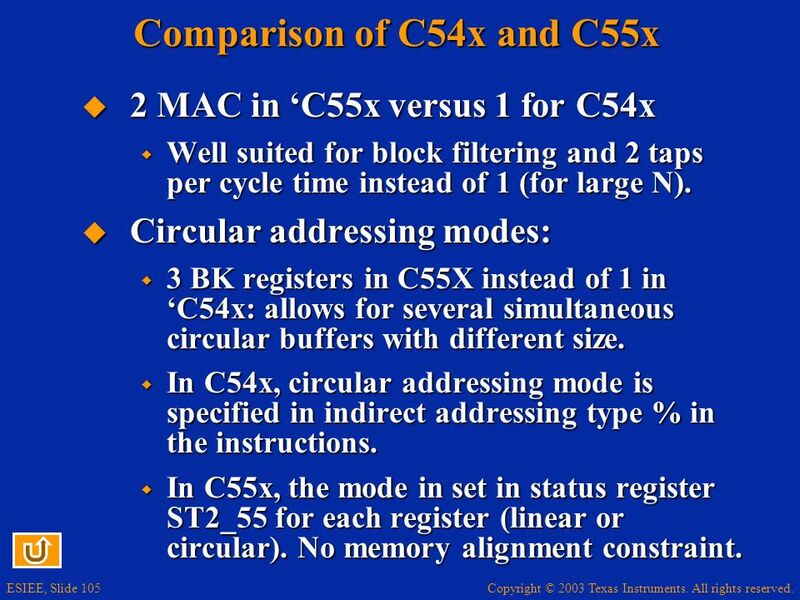 Circular addressing modes: 3 BK registers in C55X instead of 1 in ‘C54x: allows for several simultaneous circular buffers with different size. 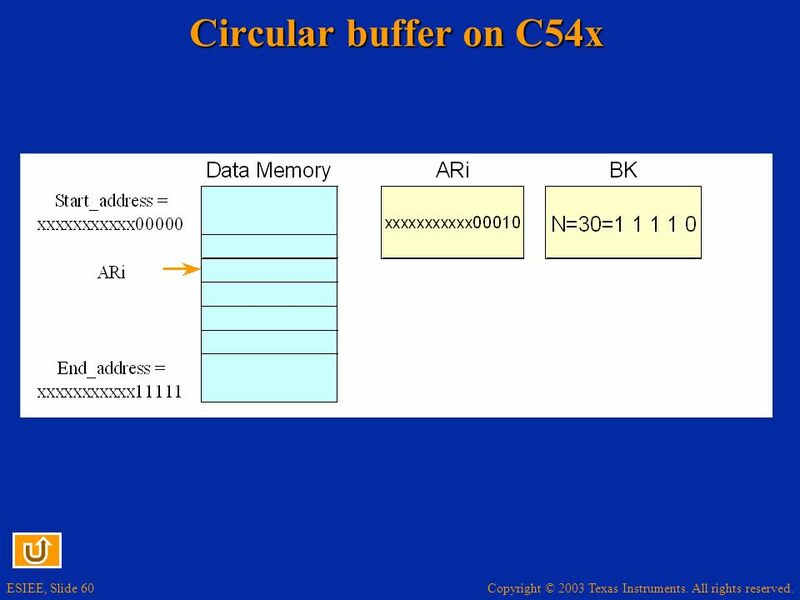 In C54x, circular addressing mode is specified in indirect addressing type % in the instructions. 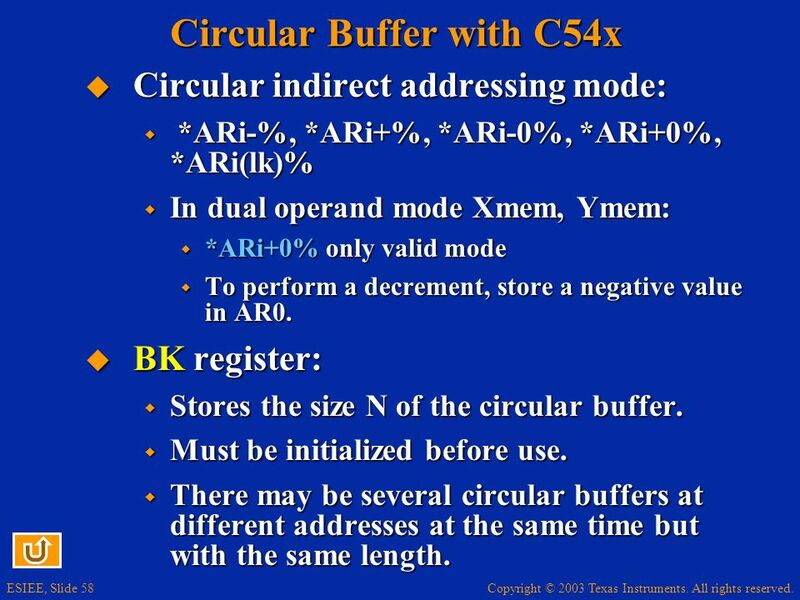 In C55x, the mode in set in status register ST2_55 for each register (linear or circular). No memory alignment constraint. 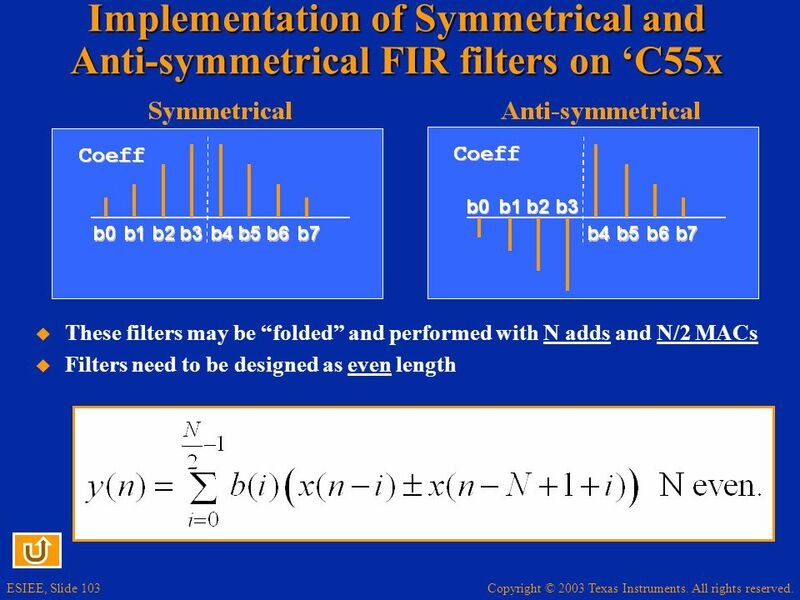 In C54x, instruction FIRS: Allows 2 taps/cycle for a symmetrical FIR In C55x, instructions FIRSADD + FIRSSUB: Allow us to efficiently implement symmetrical and anti-symmetrical FIRs. 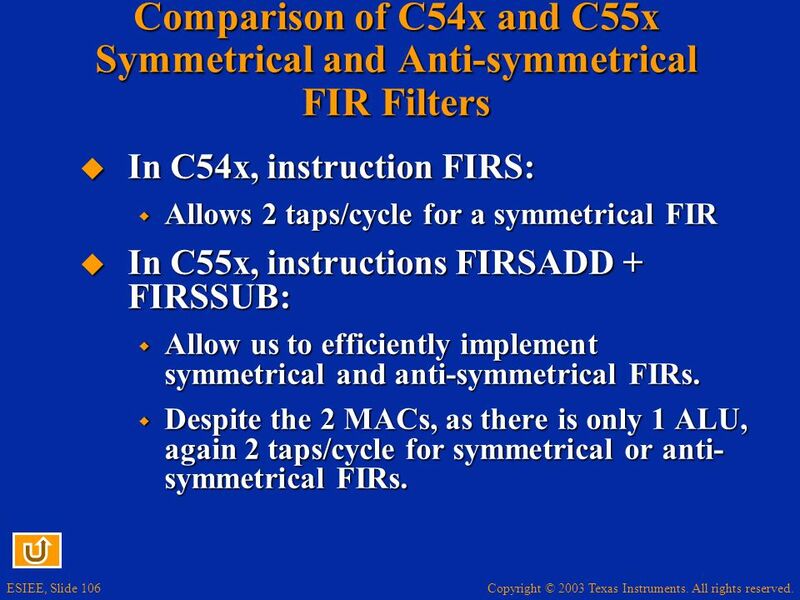 Despite the 2 MACs, as there is only 1 ALU, again 2 taps/cycle for symmetrical or anti-symmetrical FIRs. 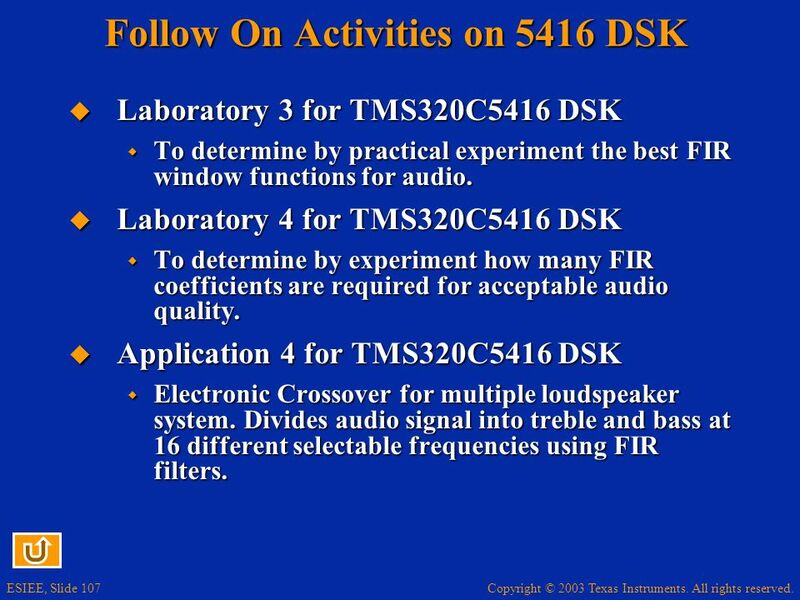 Laboratory 3 for TMS320C5416 DSK To determine by practical experiment the best FIR window functions for audio. 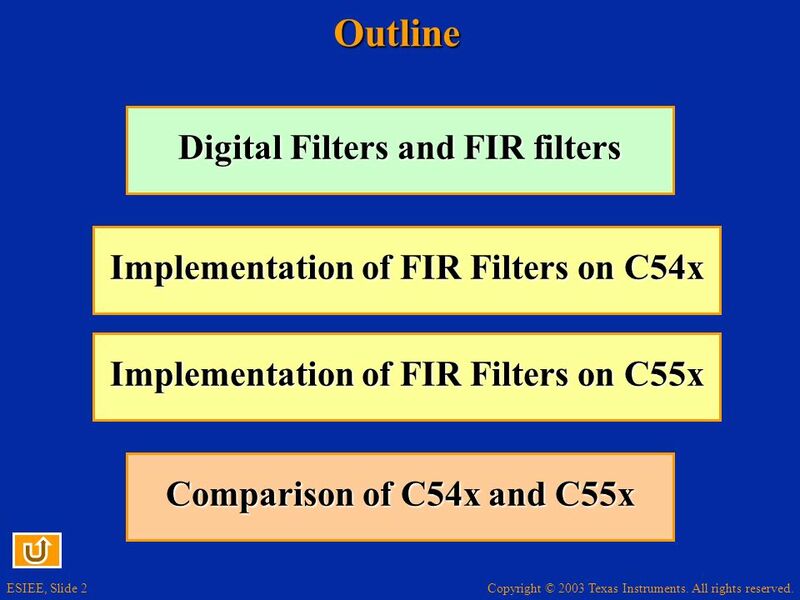 Laboratory 4 for TMS320C5416 DSK To determine by experiment how many FIR coefficients are required for acceptable audio quality. Application 4 for TMS320C5416 DSK Electronic Crossover for multiple loudspeaker system. Divides audio signal into treble and bass at 16 different selectable frequencies using FIR filters. 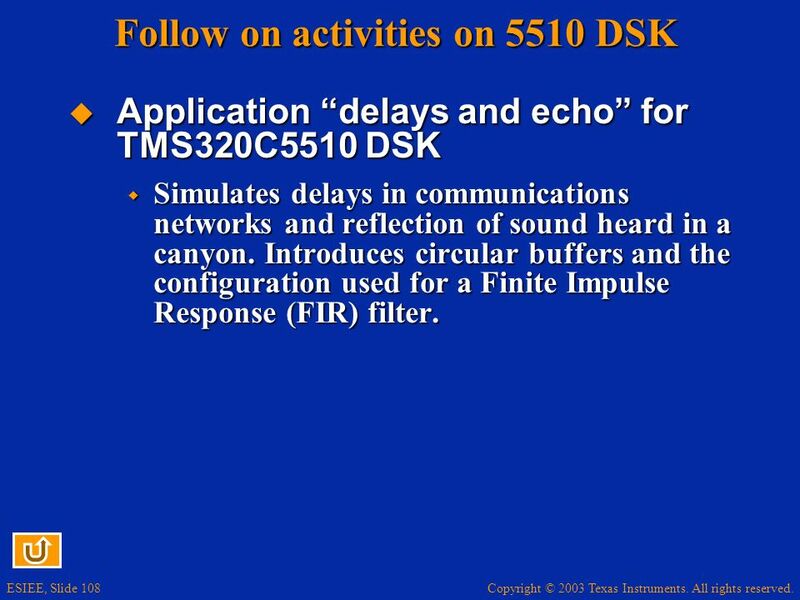 Application “delays and echo” for TMS320C5510 DSK Simulates delays in communications networks and reflection of sound heard in a canyon. 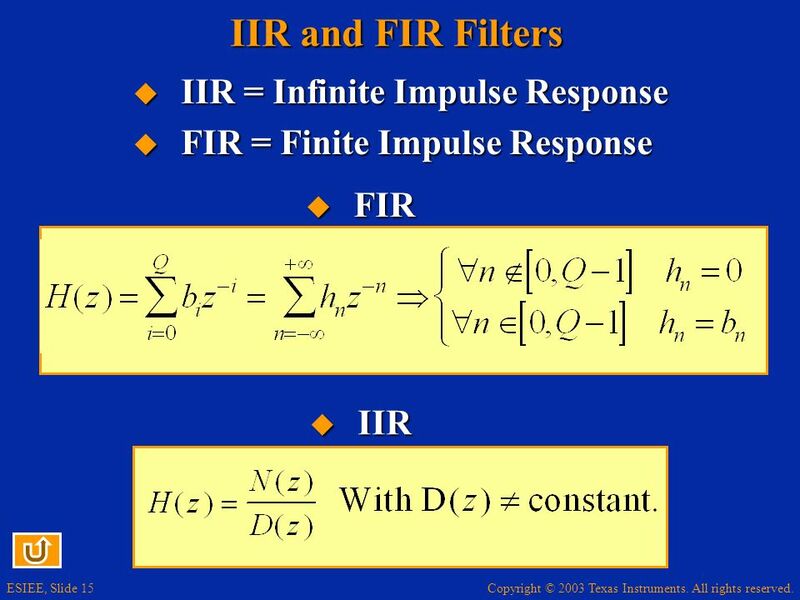 Introduces circular buffers and the configuration used for a Finite Impulse Response (FIR) filter. 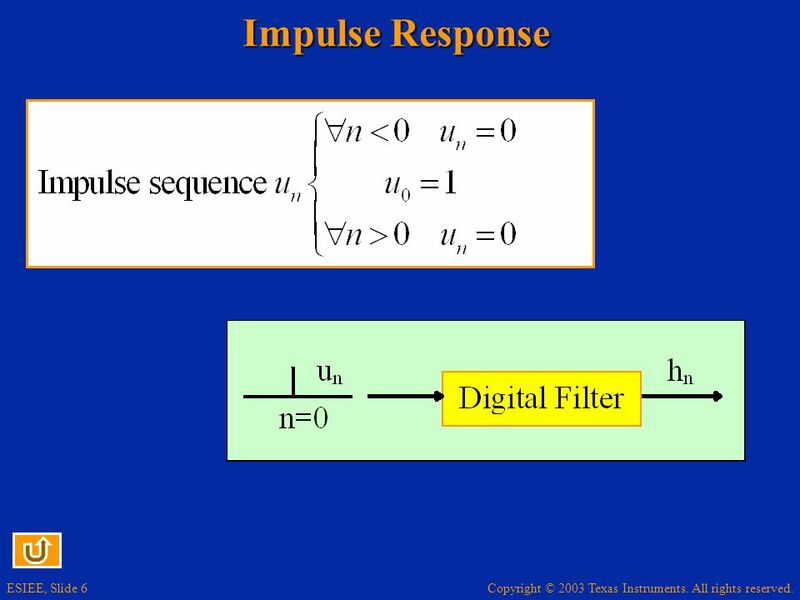 Download ppt "Chapter 14 Finite Impulse Response (FIR) Filter Implementation"